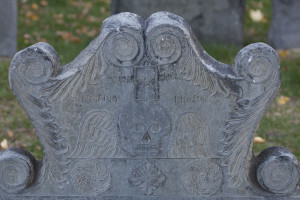 Massachusetts | Retired and Lovin' it. 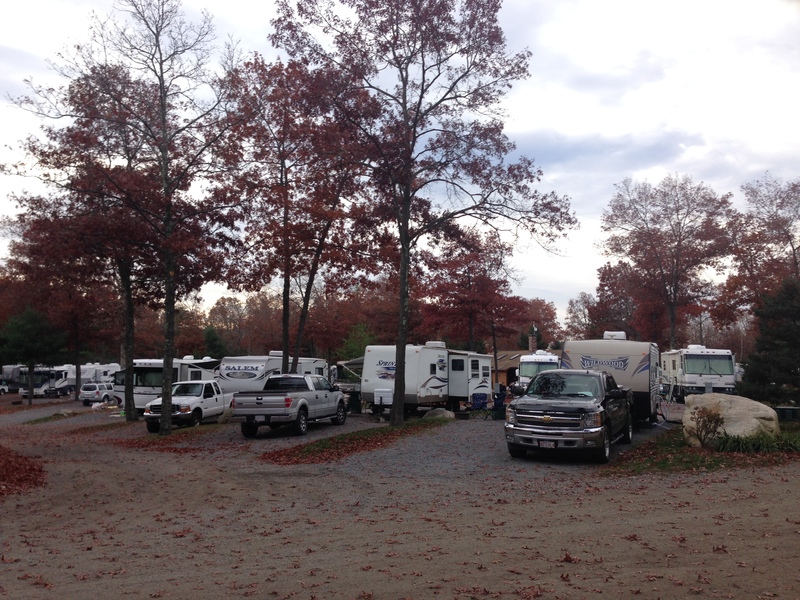 The campground is practically full. 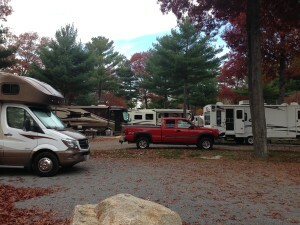 Two days ago there might have been two RVs per row at the campground. Now you might find one spot every other row that’s open. We walked the grounds this morning. In addition to the facilities in the Rec. Lodge, they have a dog run, a bicycle course complete with jumps, a horse shoe pavilion, boccie ball courts, lean-to and tent camps, a Frisbee golf course, and (drum roll) the Kamper’s Kitchen is open this weekend. Kamper’s Kitchen is serving breakfast, lunch, and dinner. They feature steamed dinners including twin lobsters for $19.95 and steamers 1 lb for $10 and 2 1b for $19. The kitchen is catered by Fresh Catch Restaurant and should be quite fresh. This is the last weekend the kitchen will be open this year. Ellen just sent me out to get BACON at the kitchen. We had bacon and eggs, mmmmm good. I ordered two lobsters and a pound of steamers which we’ll pick up around noon. 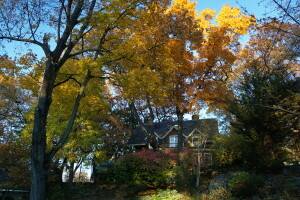 The wind picked up yesterday and cleared enough leaves off the trees that I can get direcTv now. I have mixed feelings about that. 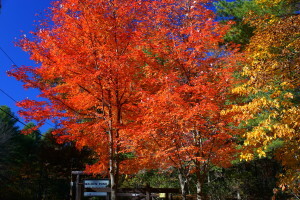 As we head south we should return to peak foliage in the Carolina s.
Time is running short now. Ellen wants to be home on the 19th a few days ahead of my sister’s arrival. That gives us 13 more travel days. We guesstimate it will take 7 getting home and we’ll visit Jessie for 3 days on Hilton Head Island. That gives us just 3 discretionary days. 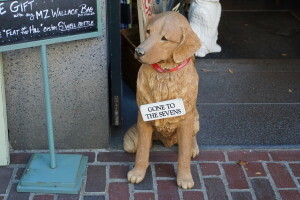 Gone is any though of taking the ferry to Montauk, gone the thought of driving the outer banks and taking the ferry from Ocracoke to Swanquarter NC., gone time to visit Judy Pane in New Orleans, gone any hope of visiting Washington DC. Just as we had to buzz east and skip so much that we passed right by, so we’ll have to buzz west. 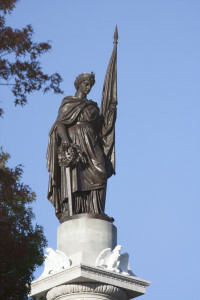 We will visit Valley Forge, and forts Miffin and Mercer and a detour from Jackson to Natchez and back to Vicksburg. From there we’ll find our way to 40 and head West keeping an eye on the weather. It is not sad to be winding up or tour. It has been big fun. The Beast will sit at the ready for our next road trip. Ski season appears to be starting in California. 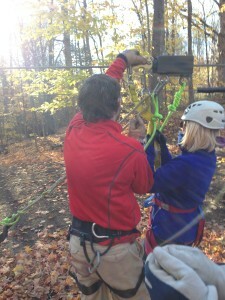 We still have some loose ends to tie up for our trip to Ecuador and Peru this spring. One fellow we met said the second year of retirement is the hardest. The first year you spend working down your “bucket list” and the second year you twiddle your thumbs wondering what to do with your free time. I do not think we’ll have that problem. We have so many interests in addition to travel and photography and we could spend a lifetime mastering just one of them. This entry was posted in FUN, Massachusetts, RV Trips, To New England, Travel Resources on November 7, 2015 by up4air. 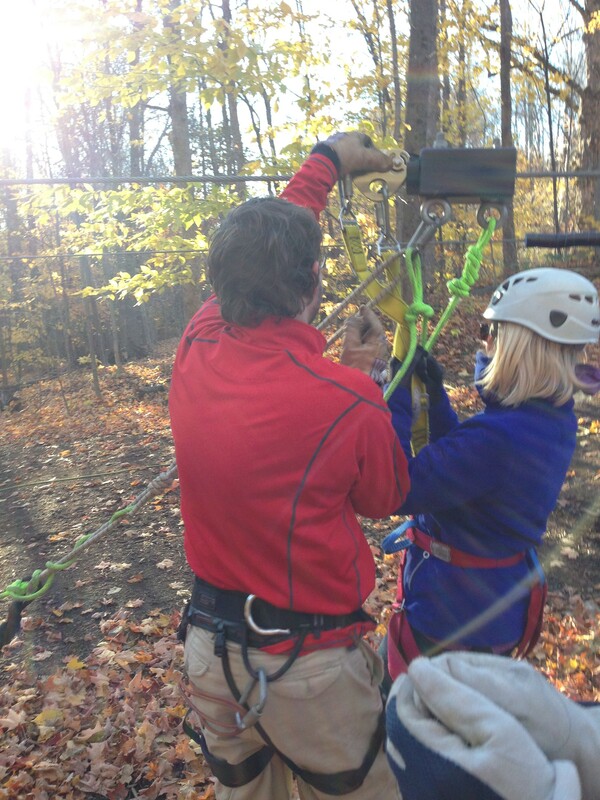 Zip-lining 10/30/15, How Could I not Feature THIS? I had forgotten to mention this little detail. 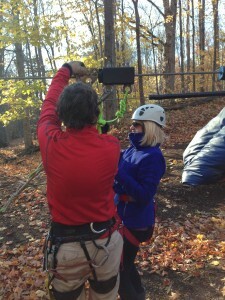 Our zip-lining experience was delayed mid-zipping. While a gal in the other party was coming in, the high five landing got messed up. She whacked into the brake rope. She was not badly hurt, but there was some bleeding and she was stunned. Then she noticed that an earring had torn out! It was not just any earring, but was titanium with three gemstones. We all went on the hunt for a good 15 minutes. 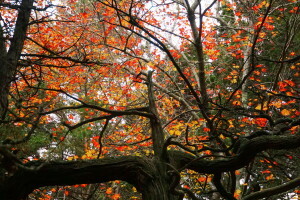 I was giving up hope of ever finding the earring in the deep autumn leaves when I heard, “Here it is! !” We were happy to be on our way and happier sill that she was all right and had her earring. There was some banter about high fives after that, but there were no high fives. Just as you should not wear jewelry scuba diving, don’t wear earrings zip-lining anything can and does happen. 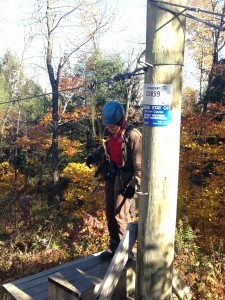 Ellen and I tried to get a spot on the Zip line at Stowe, but it was booked for the day. 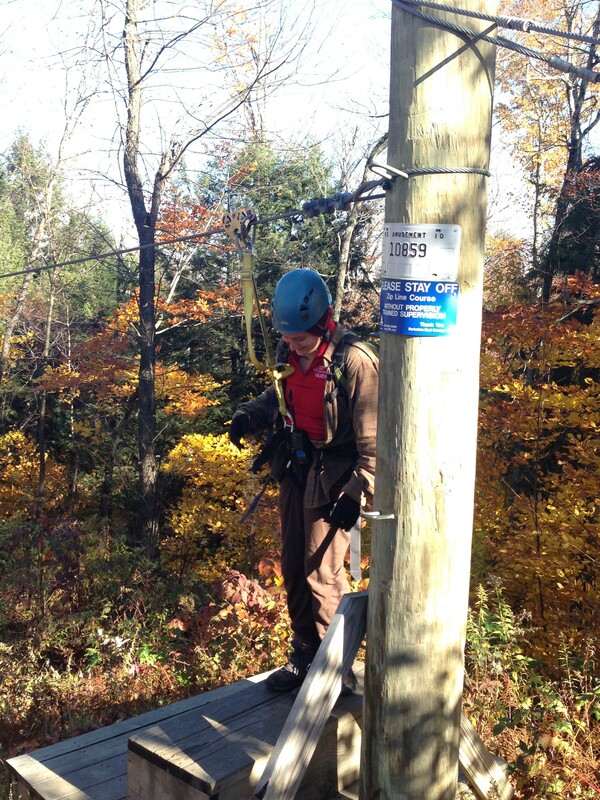 We looked for zip lines almost everywhere we went after that. 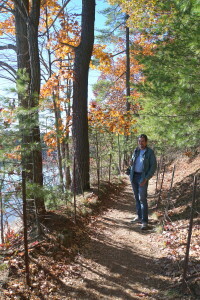 The one day we might have gone in the Berkshires , the weather was cold and we opted not to go. Toward the end of our visit with Ed and Jean, Terry, one of their friends, suggested going zip lining to Jean. There were two more spots available, would we like to go? What? Of Course we would. We signed up. The weather for the next day was projected to be cool perhaps cold. 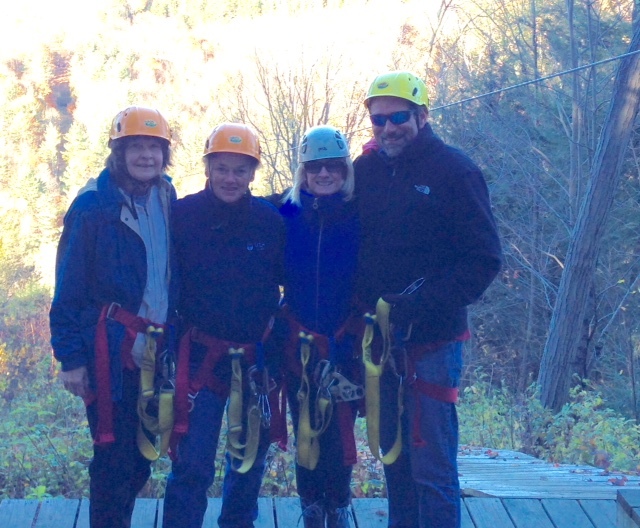 We met Terry the next morning and the four of us went to Berkshire East, a ski resort that offers mountain biking, a mountain coaster, and a long series of zip lines. This is the same place the cold weather had “scared us off”. This day the sun was out and the weather was cool but growing warmer. This was a blast. 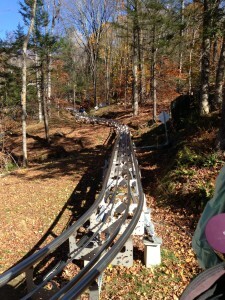 Terry wanted to do the mountain coaster before the zip-line. We had signed up for that as well. Jean wasn’t interested. Terry wanted to go fast and asked Ellen if they could go together. Added weight makes for more speed. They were first up the coaster. 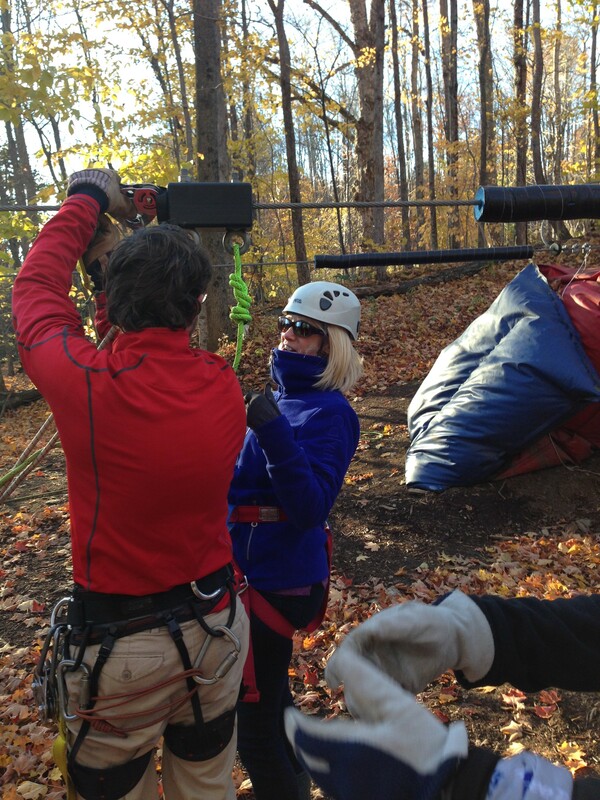 That was a gas, and more exciting than the zip lines. 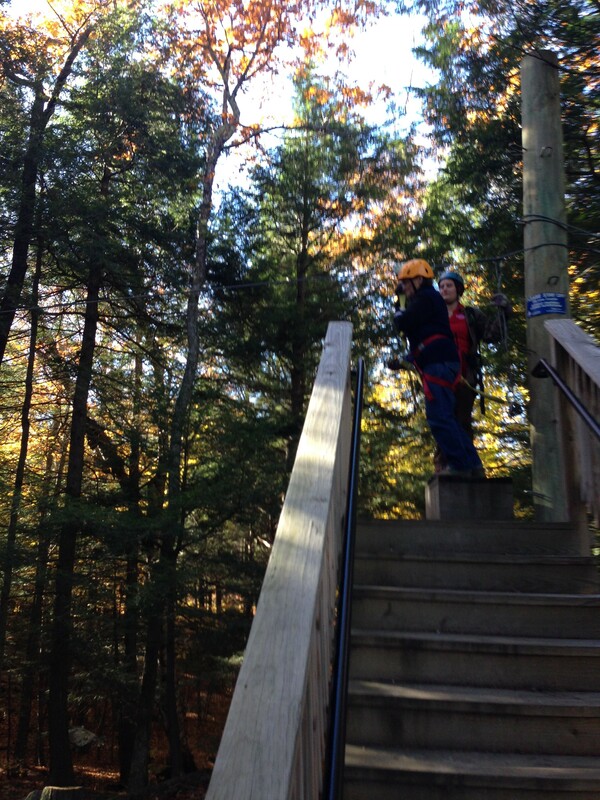 The zip lines were exhilarating; a great blend of speed and awesome views. Here is a sampling of our photos and videos all shot on iPhones. We did not want to be burdened carrying heavy camera equipment, nor did we want to drop one or have to recover the pieces. NOTE: the videos will not play in place, you’ll have do download them (click on the link) then play them locally. 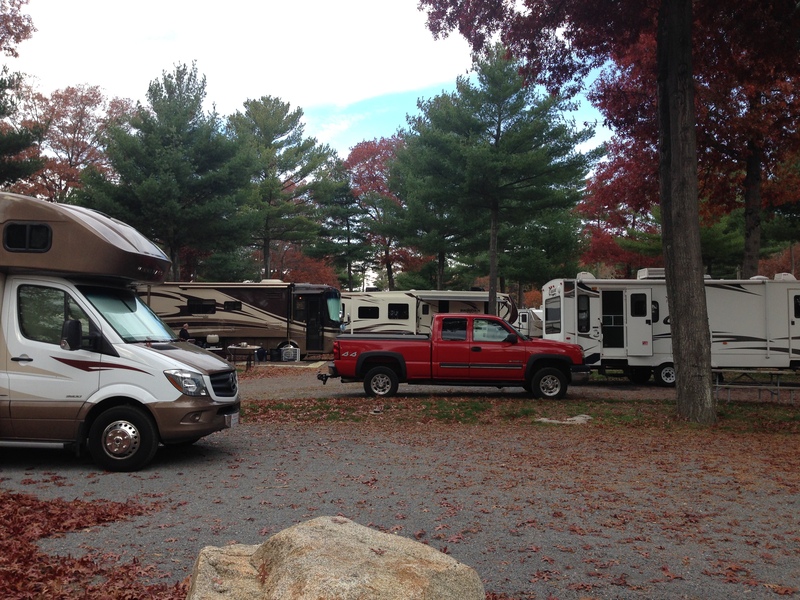 This entry was posted in FUN, Massachusetts, RV Trips, To New England on November 6, 2015 by up4air. Today we left still later than usual. We stopped by the Normandy Farms office to extend our stay another day. Our campsite is booked on 11/05. and the entire campsite is booked this weekend. Is there a PAT’s game at Gillette Stadium? Probably. 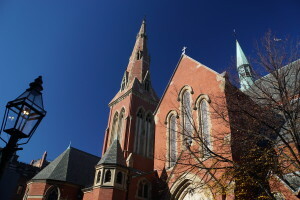 We’ll be moving on to Rhode Island, though we may visit Boston one last time. Our first stop was Concord. 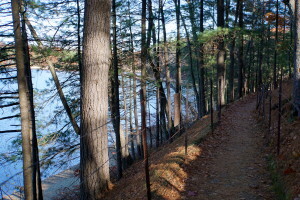 I have fond memories of family visits to Walden Pond as a child. 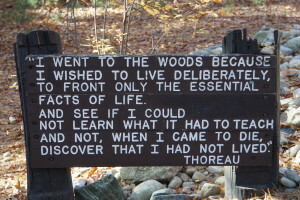 I caught craw fish, walked and swam in the pond, and read On Walden Pond by Henry David Thoreau. The pond holds a special place in my memories. The parking lot as I remember it is on the right as you drive past the pond. Not so any longer. We drove right past the large parking lot to the left before the pond. Another U-turn for the record books. Luckily, I am not counting. 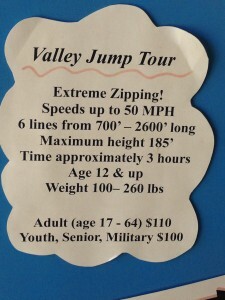 There is an $8.00 fee for all day parking, $10.00 for out of staters with an electronic payment kiosk at the entrance. When we drove up there were two cars ahead of us and two guys at the kiosk not making any progress. I walked up to make the count three. The first fellow tried everything he could think of and anything we two suggested. Nothing worked. Then a passer-by said, “That machine will not work with the new chip cards!” Oh, right. Things went smoothly thereafter. Funny though, The two guys ahead of me paid, got their ticket, and drove off. There I was at the kiosk with forty feet between me and our car. The fellow in line behind us grew very impatient as i was paying our parking fee, to the extent that he had words with Ellen and was starting to drive around us as Ellen moved into the driver’s seat and I walked back to the car. He said something about holding the line up and I responded with, “You cannot wait a few minutes while I get a ticket. Why are you in such a rush?” Apparently, Ellen had already suggested he cool his jets. We parked and never saw the guy again. 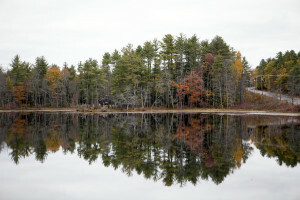 Apparently Walden Pond has grown more popular in the past 50 years. 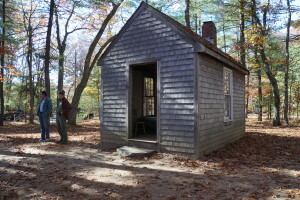 The parking lot is many times larger, there is a mock up of Thoreau’s house near the parking lot, and a huge visitor’s center is under construction. 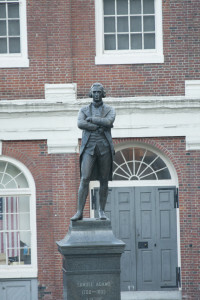 A statue of H.D. 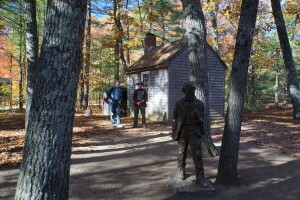 Thoreau stands on the walkway toward the pond and a ranger greets visitors. Nick said the population has roughly doubled since the ’60s and a number of improvements have been made. Yes the parking lot used to be past the lake on the left side. 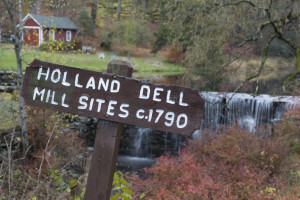 Prior to 1974, the pond was administered by the town of Concord though the land is owned by the state. 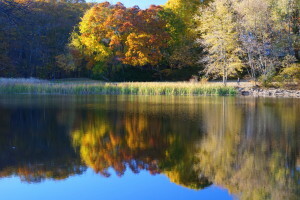 In 1974 the area became a state park administered by the state park system. 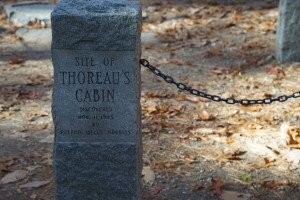 Cement piers have been erected at the site of Thoreau’s home. 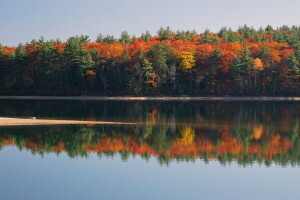 Nick also mentioned that Walden Pond, a glacial lake, is the deepest body of water in Massachusetts at 100 feet. I asked about fishing. I was an avid fisherman back then, but never caught anything on the lake. Nick said the lake has been stocked, there are big mouth bass, trout, and muskellunge. 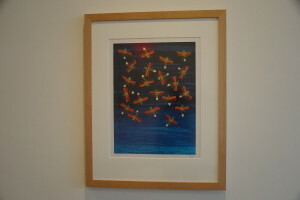 A passerby stopped to say, “Yes, there are muskellunge in the pond, but they’re hard to find”. 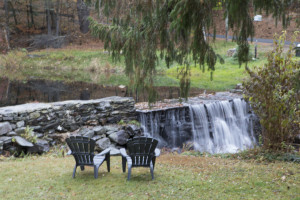 Nick said the lake drops off quickly and there is no water flowing into or out of the pond. There is no natural place for the fish to congregate and local fishermen will not share where they find the fish. Nick also recommended that we walk around the lake. Today was a very unusual day for November; it was much more like September. There was no wind and not a ripple on the lake, except for the wake kicked up by two swimmers. The air temperature was in the low 70’s with highs in the low 80’s in the sun. It was glorious to be walking the lake remembering things as they were years ago. 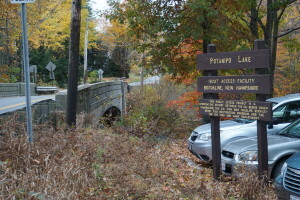 One summer Greg, Fitzi, and I bicycled from Arlington to the pond up Rt 2! We took a number of photos as we walked around the lake. 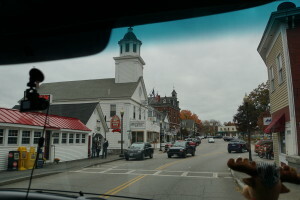 From Walden Pond, we drove through the towns of Concord and Lexington. Not surprisingly, both have grown in size. The streets are very busy. I had hoped to find Buttricks Ice Cream in Lexington. 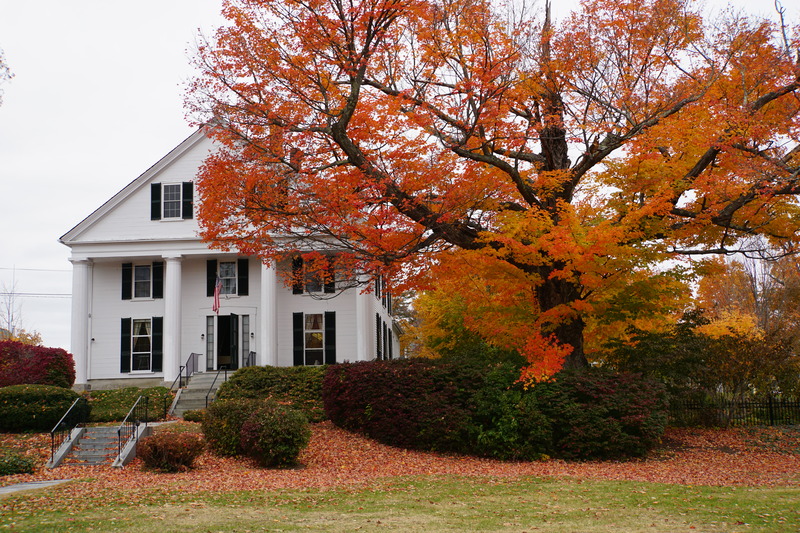 The family would drive to Buttrick’s on Sunday afternoons for a family drive and a treat. Mom would always have Mocha Almond Fudge in a cup. I always had a coffee frappe. I could not find Buttrick’s in Lexington or in Arlington. They and Brigham’s have gone out of business? From Lexington, I drove to Arlington thinking I’d remember the way. I didn’t! 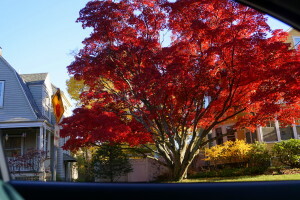 We wound up using GPS to drive into Arlington on Summer Street, a back road and not Mass Ave.! 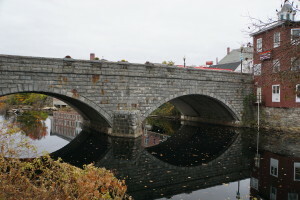 I recognized the turn onto Mill Street by the old Sporting Goods Store build near the bridge over Mill Brook. The Sporting Goods Store was gone. 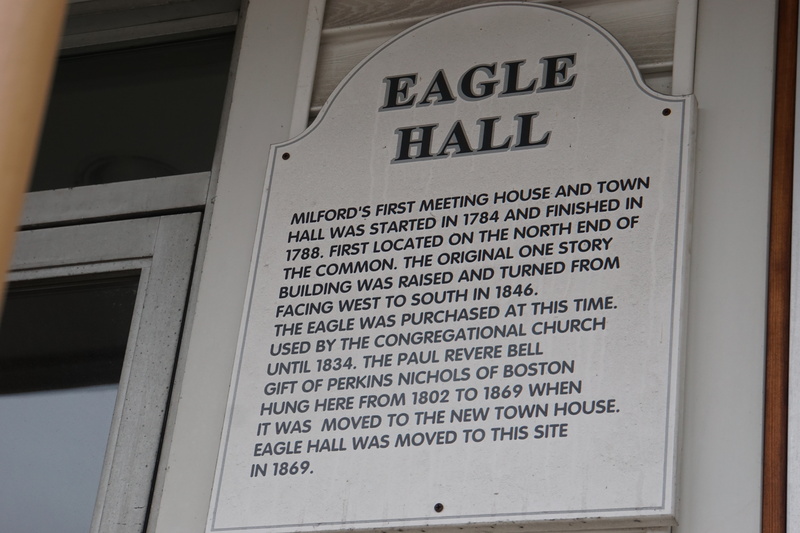 School was getting out and traffic on Mills Street was wicked (a Massachusetts term). Turning Right on Mass Ave. we passed Arlington High School. I turned left onto Field Road and left again onto Woodland Ave to head back to Bartlett Ave. 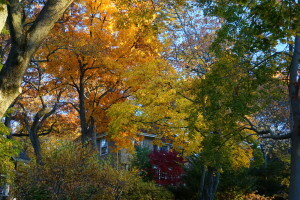 This was my old home turf, between Mass Ave., Bartlett Ave, Brantwood Road, and Pleasant Street, and especially Menotomy Rocks Park. This park was one of my go-to places to fish, climb rocks and trees, make lean-to hideaways, and imagine life hundreds of years ago. 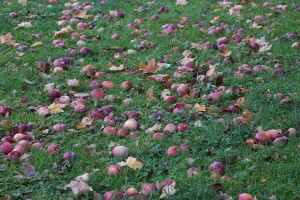 I played a few football games in the field here. Used a fly rod to catch bats in the evening. We discovered this could be done while practicing fly casting one evening. Funny how the streets that seemed too wide and long as a child, look narrow and short today. 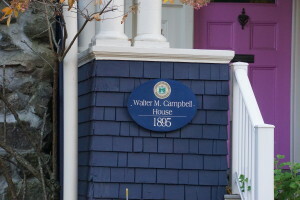 I drove Bartlett Ave and pointed out Harry’s house, our doctor’s house on Jason Street, Rick’s house on Gray Street, Fitzy’s house at the corner of Gray and Jason. 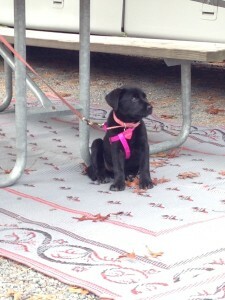 We walked the pond in Menotomy Rocks Park stopping to talk with two older gentlemen who happened by. The small merry-go-round was gone. Older kids would turn it so fast that smaller kids would be launched from it or get sick or both. I was both a smaller kid and later one of the big ones. 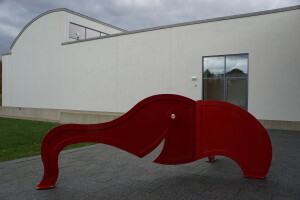 I remembered tobogganing down the slope above the now playground and having the toboggan hit a tree and split in two. We had all bailed out before impact. 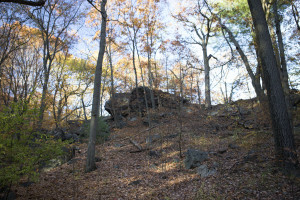 Then there is “Eagle Rock”, an outcropping in a hillside that was a favorite place to play and imagine other times and places. 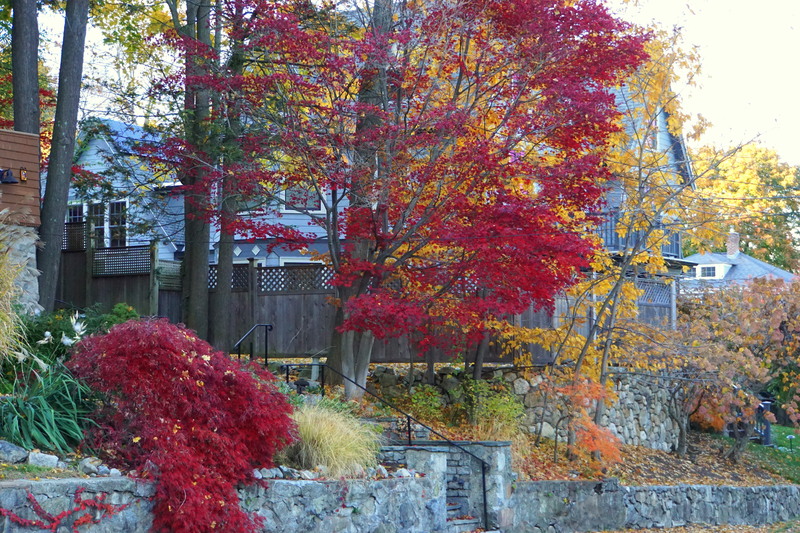 My Neighborhood in Arlington Mass. 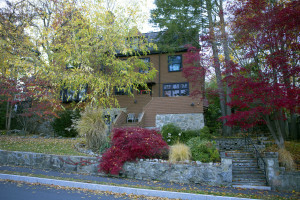 We walked across Jason Street and up Brantwood Road to Kensington Park and the house where my siblings and I grew up. The houses are just as I remember them, though the colors have changed. There was the house the English Professor rented, there the house the Lickliter’s owned, there the house where I raided the concord grape vines one summer, there the house where my childhood friend lived and his father had me help harvest his pears. He was a psychologist. 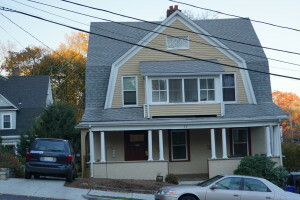 There the house the first black family in the neighborhood bought. And there was my old house. 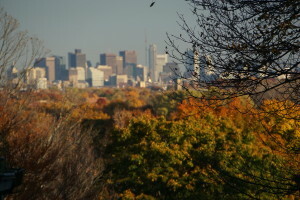 I had forgotten that I had a view of the Boston skyline from my 3rd floor windows. 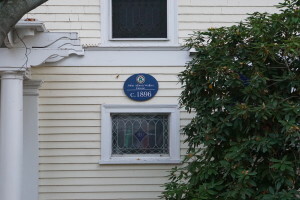 Many of the houses in the neighborhood now have a historical plaque displayed prominently by the front door announcing the original owner and the year the house was built. We walked past the house where I was badly bitten by a dog. We walked past the house where I traded something of value for a small toy car. My parents walked me back to that house and had the trade reversed after they read me the riot act and had calmed down. 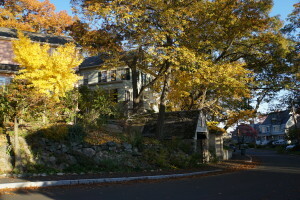 We walked past the house the artists owned where I often climbed the highest pine tree in the neighborhood as high as I could go and felt the wind sway the vary top of the tree. We walked past the house where my friends and I interrupted a girl’s sleep-over (I will say no more). Thanks to my mother’s decision to move into a neighborhood with extremely good schools, I had the joy of growing up in a thriving neighborhood. Hunger set in and we headed to Arlington Center for a bite. 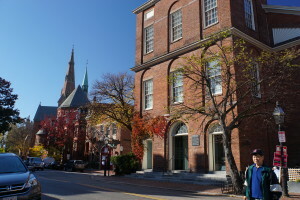 We drove past the center and on to Harvard Square, passing the old sub shop, the old pizza shop, the fire station, the music school (that was no longer there), and into Cambridge. We parked in pay for parking and walked the square. Except for some large developments on the south side of the square, the buildings were the same as I remember but the shops were entirely different. I had hoped to stop by the Hoff Brau,, but it was gone. We walked past a number of fast food restaurants and cafes looking for an inviting place to eat. The deviled eggs on the menu at Grafton Street Pub and Grill really appealed to me. 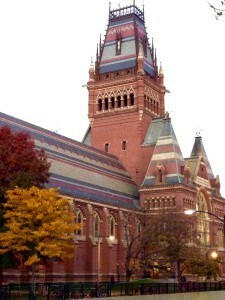 Ellen suggested walking Harvard’s campus which was just across the street. Off we went. Sometime later we discussed where to eat. Should we continue on or go back to Grafton. By now we were both starving and I was getting testy and really wanted to go back to the pub. Ellen, agreed we go back. We ordered deviled eggs, clam chowder, the Pork Loin entree and the steak entree. The meal was paced slowly giving us time to savor each bite. This might just be the best meal I have had on this trip. The Pork Loin was fabulous. Ellen had a remarkable steak and potato and arugula dinner. She had ordered the steak done medium rare and it arrived rare. I assume the waitress did not hear the “medium”, She went off shift before the entrees arrived. I mentioned that Ellen’s steak was done too rare;; Ellen added that she wanted the meat done medium rare, and the dish was whisked away. It took quite some time for the dish to return. The manager arrived with the steak. He said that rather than simply re-heating the meat, they had prepared and entirely new serving as the dish would lose some of its flavor if it were just re-heated. This was great service and a wonderfully presented and timed meal. On the drive home I missed a turn and wound up driving back and forth across the Charles River before finding route 90 south. Boston is like that. The roads are not well marked and often if you are not setup well ahead for a turn, you will have no way to make it. In California, we have Bots Dots, reflectors built into the highway. That reflection makes the lanes quite visible. We even have lighted roadways in many cases. In Massachusetts the roads are dramatically dark, the drivers can be anxious and dart across lanes; and the roads are notoriously poorly marked. Driving at night can be challenging. Home again,, the beast sat awaiting our return. 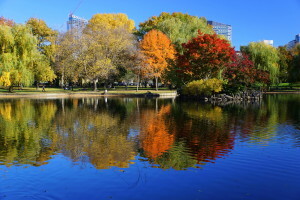 This entry was posted in Massachusetts, RV Trips, To New England and tagged Arlington, Cambridge, Grafton Street Pub and Grill, Harvard Square, Henry David Thoreau, photoographs, photos, Walden Pond on November 5, 2015 by up4air. After weeks of on again off again good weather with a smattering of cold rain, drizzle, and freezing temperatures, today was an amazing day. The sky was clear, there was no wind, and the temperature soared. It might have hit 80 degrees today. Many people were sporting T-shirts on the Gardens. It’s November in New England; this is September weather. 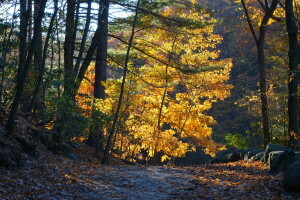 Sometimes we get a few weeks of great weather in mid October that’s called Indian Summer. 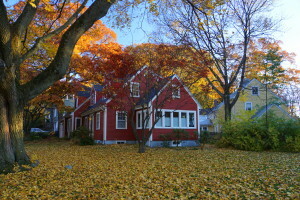 Mid October is one of the best times of the year to be in New England. This November weather is both highly unusual and very welcome. This morning we had our typical late start on the day. Retirement does that to a person. We had our morning coffee and some breakfast in The Beast, then a time warp set in and *pop* it was 11:30 as we drove toward Riverside Terminal in Newton for the train to Boston. It’s a half hour drive to Riverside from the campground and another forty minutes to downtown by train from the station. With plenty of parking we had no problem leaving our rented KIA at Riverside. The Beast we left safely at the campground fully setup for our return. Why is it that ticket kiosks are setup with the display facing the sun? There were three ticket booths that were not usable! There was no way to read the text. I tried shielding the display with my hand, my body, my day pack and nothing worked. Luckily there were two more ticket booths at train level upstairs that were oriented away from the sun. I said, “How poorly designed, to have the ticket kiosks directly facing the sun” and a ticket agent sitting nearby said, “Tell me about it. Those went in six years ago and were planned to face the other way. It’s been six years and nothing has been done to change them back. You should be here for a game.” He then took a ticket from his pocket and asked where we were going. “Arlington Station” I said. He then showed how to add a fare to the ticket; in this case four of them: two out to Arlington and two returning to Riverside. He said you can add more to the ticket as you need. Any number of people can share one card. 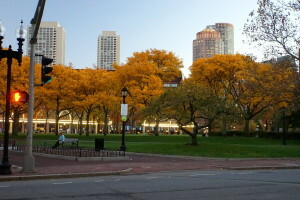 He then activated the style for each of us and we boarded the inbound platform bound for Boston Gardens. 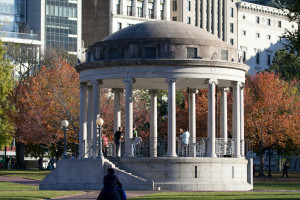 I know Arlington Station from my years as a teenager going to the Commons and Gardens to meet with like minded friends from all around the greater Boston area. 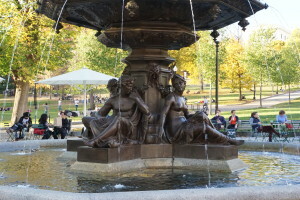 We would hang out on Charles Street at a cafe or lounge around the Commons. It was a far more exciting place to be than my home town or Arlington, though we would also frequent Harvard Square. I was curious to see if I would remember how to get around Boston. The last time I visited the city on foot was 46 years ago. The train from Riverside makes 17 stops on its way downtown. It does take some time, though the train was near empty when it left and never became crowded. We got off at Arlington and took the stairs up into brilliant sunlight and a very warm day. Ellen immediately took her coat off. I was toasty in my shirt. 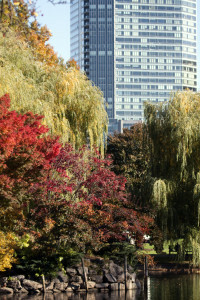 Boston Gardens is a beautiful open space in the heart of the city just south of Beacon Hill and Boston Commons. 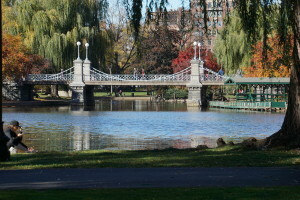 I remember swan boats on the small central lake, but there were none today. Either they no longer ply the lake or they’ve been retired for the season. What a gorgeous day. 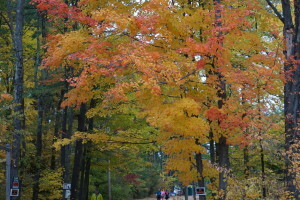 Many of the trees were in full color. 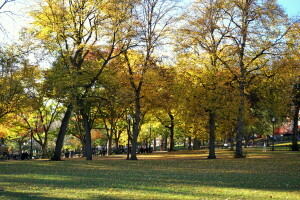 There were couples walking the grounds, students reading under trees, people on their lunch break enjoying a warm day outdoors. It felt like I had never left. The city was no more crowded than I remembered, though there was significantly more traffic. 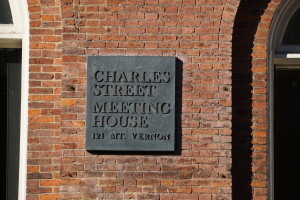 I found Charles Street easily; this was our hangout. Jim, Frank, and I would while away Saturday afternoons in Brigham’s talking about whatever interested us. That began a wonderful lunch. Ellen ordered a beat salad and I had the basil Gnocchi, both were exceptional What made the gnocchi especially good was the way they were placed in a bowl swimming in marinara sauce topped in the center with a mild cream and cheese sauce and flanked with fresh tomato and basil. The dish avoided becoming boring; each bite was different than the last. 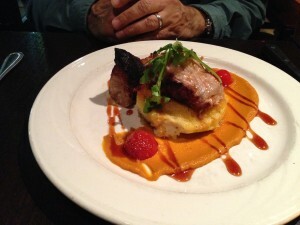 I highly recommend Figs Restaurant at 42 Charles Street. The restaurant is small with bare brick walls and closely arranged tables. The restaurant can get noisy. That is a small price to pay for the quality of our lunch. 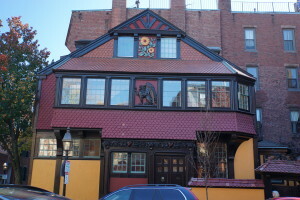 We walked Charles Street as I recalled some infamous moments Jim and I shared in 1967 and 68 here on Charles Street. 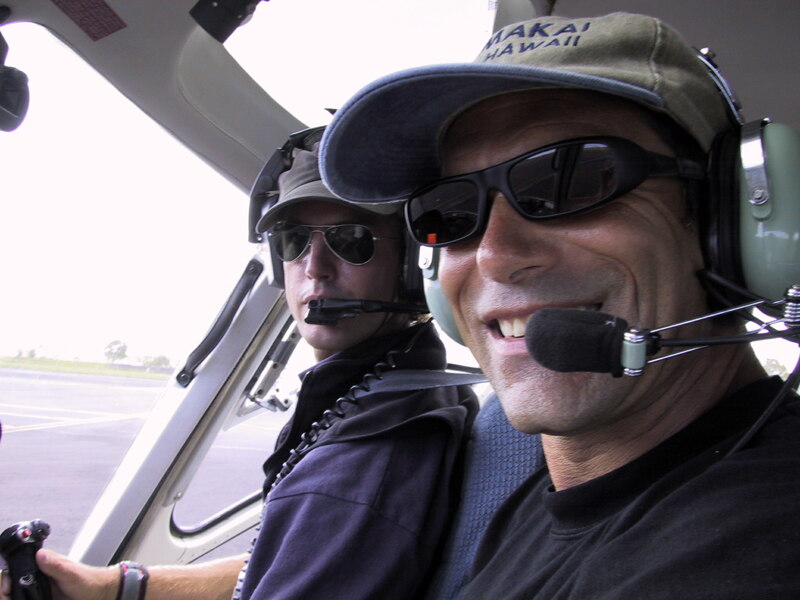 We had fun together, Jim and I. 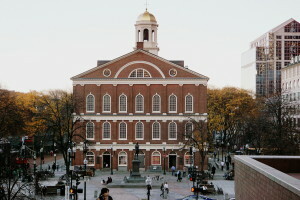 From Charles Street we went back to Boston Commons to find the Freedom Trail. We saw it marked on a typical tourist map and thought it would be interesting to follow. 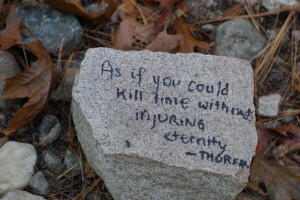 What I did not expect was to find a brick path laid in the sidewalk with banners and trail markers along the way. 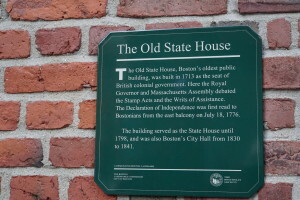 It is quite an historic route winding past the State Building on Beacon Hill. 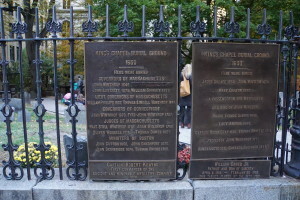 We walked and talked and followed the trail past King’s Chapel Cemetery, the oldest cemetery in Boston, to the Old Meeting Hall where the Declaration of Independence was first read to the people of Boston, on to the site of the Boston Massacre, and to Faneuil Hall, and the Marketplace. It was in the Marketplace that I saw Steamers on a menu. 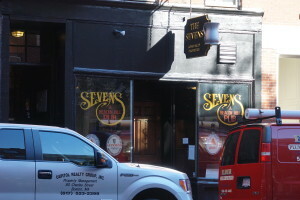 “Yes, we have steamers.” Then “Well, let me check to be sure we still have some.” And finally, “Yes, would you like an order?” Wow, finally I can order some Steamers and beer in celebration of the afternoon I spent with my Mom the last time we were both in Boston together. 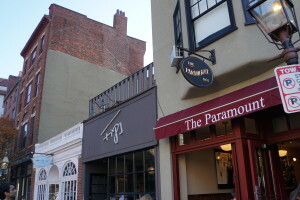 Then I had Steamers and beer a number of times as Mom and I walked around Boston and talked. The beer was a small pour, but good. The Steamers were all that I had expected. Everyone makes noise about Maine Lobster. I enjoy lobster, though I prefer steamed clams and Dungeness Crab by far. I suppose I prefer Steamers to crab only because I’ve had so few clams and so much crab these past few years. By now it was getting late. We walked down to Christopher Columbus Park by the harbor, past Joe’s, then headed back to the Arlington Station and home. Along the way we stopped into “Thinking Cup”, a coffee and pastry shop and left with a berry rice pudding and a caramel cheesecake. We found the Boylston Street outbound subway station. It was rush hour and the D-train headed to Riverside was crowded. 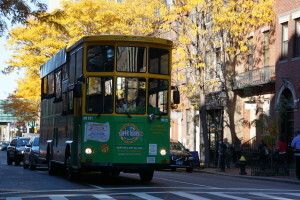 There was standing room only with more passengers added at the next few stops before the car half emptied out at Fenway. Past the Chestnut Hill Station, the train became an express going directly to Riverside. The pastry survived the trip intact. Going home, traffic was heavy but flowed at a good clip. Our iPhone GPS apps guided us right back to Normandy Farms Campground. I punched our code into the gate control and we zoomed in at 9 mph. The Beast stood at site #1001 propped on his stabilizers, awaiting our return. With a twist to turn the water on, a push of the LP button, and some light switches we settled in for the night. Site 1001 at Normandy Farms Campground has an opening through the trees to DirecTv’s satellites. It is not perfectly flat, but it is close to the heated shower facilities with seemingly unlimited hot water and floors so clean you could eat off them. We still have not visited the weight room, pool room, or indoor pool. Tomorrow’s weather should mirror today’s. 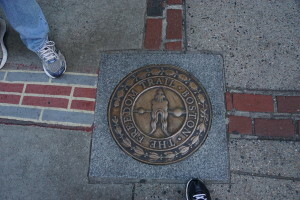 Boston beacons, we will return to follow the Freedom Trail again tomorrow, starting where we left off today. Jean O’Neil messaged us that the Museum of Science has a Pixar exhibit that presents the science/engineering behind the Pixar movies; we want to see that. Old Ironsides is moored in Boston Harbor and that is something I want to visit. 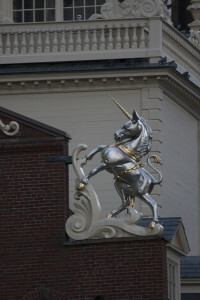 Then there is Concord, Lexington, Arlington, and Cambridge yet to consider. This morning I went over my Facebook posts since starting this road trip. How easily we forget all the people and places we have visited when faced with the people and adventure each day holds. What joy we have had! What new adventure will unfold tomorrow? Tonight the Northern Lights should be visible from Massachusetts! This is quite unusual. We’re in the country and should have a good view if in fact the phenomenon is visible. Boston’s glow to the north masked any northern light sighting we might have had. We tried. Our PVR recorded last Friday’s Real Time with Bill Maher with he interview of Tulsi Gabbard a vice chair of the DNC and guest Grover Norquist author of the “The Pledge” that republicans have signed not to raise taxes in the future. Caramel cheesecake enhanced the evening. Today will be slightly cooler than yesterday, we will tour Concord, Lexington, Arlington, Hav’ad Squa’ya, and the Pixar exhibit at the Science Museum if we get that far today. 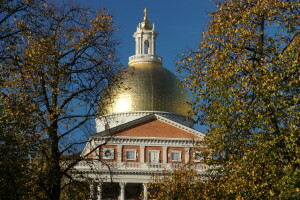 This entry was posted in Massachusetts, RV Trips, To New England and tagged Boston, Charles Street, Commons, Fall Foliage, Faneuil Hall, Freedom Trail, Gardens, Normandy Farms Campground, Old South Meeting House, Old State House, photographs, photos, State House on November 4, 2015 by up4air. We were up earlier than expected this morning after turning our clocks back an hour. The temperature was mild last night: 50 degrees outside and 57 degrees inside before we fired up the heater. Our electric mattress pad set on low is enough to keep us toasty at freezing temps. 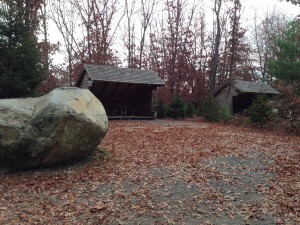 With heated restrooms and unlimited hot water, this campground was great. 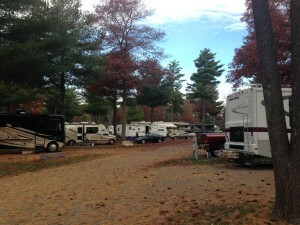 Once again being off season, the campground was very sparsely populated. 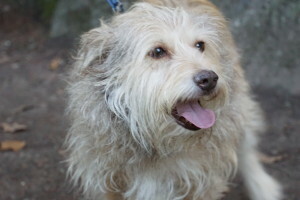 We did meet a number of couples and dogs on our walks. 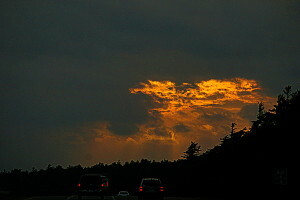 The skies were overcast this morning with intermittent rain drops striking the windshield as we drove off. There was nobody collecting fees both on the way in and on the way out. 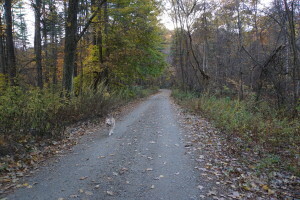 We headed further east on SR 6 toward Marconi Station and White Cedar Swamp. 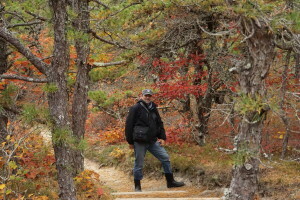 Terry, a good friend of Ed and Jean, told us to see the swamp if we visit Cape Cod and off we went. The visitor center was closed. I put the keys in the ignition, keeping my eye on a bicyclist riding toward us. The rider circled back to check out our license plate and rode over to the window. “Hi, do you need information?”, asked Bob Spiegleman. “No” I said initially, then thought better of it and added, “But there’s a wooden walkway through a swamp near by. Do you know how long the walk is?” That started a long conversation about Marconi, the swamp, steamers, did we rent our RV, wives and husbands with different last names. We had a good long conversation. 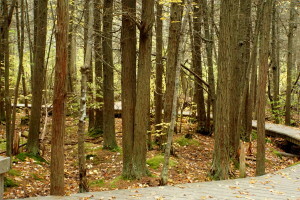 The White Cedar Swamp entrance is three quarters around the parking lot at Marconi Station. There’s nothing there now, erosion and storms took the towers. Bob mentioned friends with different last names who gave one child one last name and the other, the other. Or a couple whose last names were golden and brownmantle. They both changed their last name to champagne, a color mid way between brown and golden. Bob also mentioned that there was a 100th year anniversary for the Titanic. 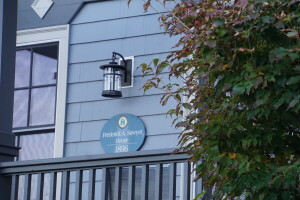 The SOS transmitted from the Titanic was received here at Marconi Station. The station contacted a boat in the vicinity which saved a number of people. We walked the bluffs where Marconi’s receiver once stood and walked off toward the swamp. 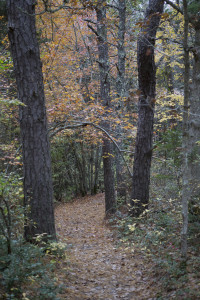 The first few hundred yards are not remarkable, but as the scrub forest grows and the light is filtered by the leaves, the walk takes on a ethereal sense of peace. 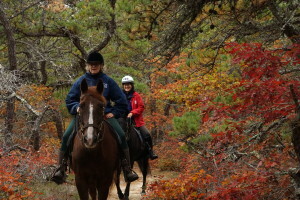 Two equestrians riding beautiful muscular horses trotted by on the trail. 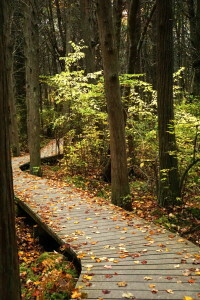 A bit further on, the trail through the scrub forest crosses a dirt road and winds onto a raised walkway over a swamp. 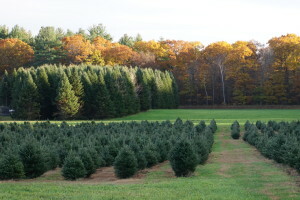 The trees change from wind blown scrub and dwarf pines to tall white cedar. This cedar must love having its “toes” wet. 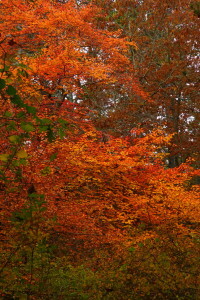 The White Cedar Forest thrives in the swamp. 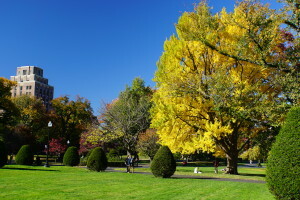 Cedar is a pine; the needles do not change color in the fall. 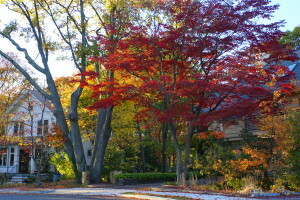 Now and then a maple towers above the cedars with bright yellows and reds. 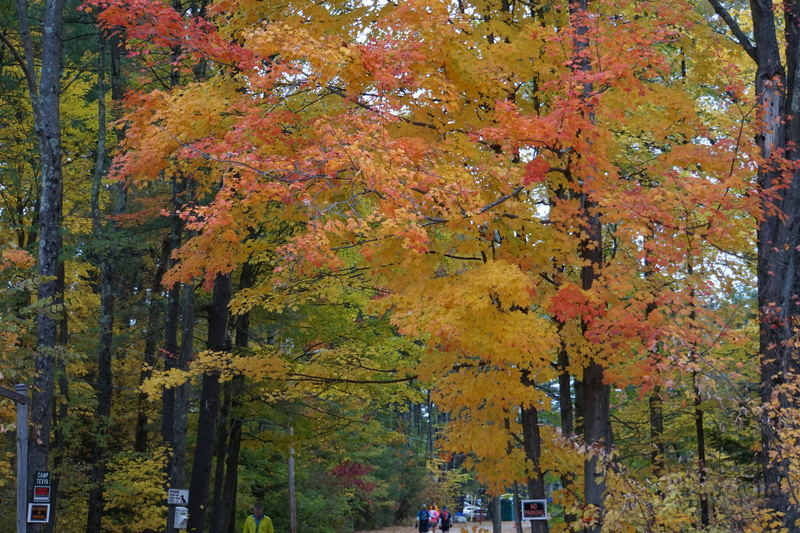 As wonderful as walking the swamp was, to see it in peak foliage would be more so. We had asked Bob about steamers. Most everything is closed now, he suggested cook’s or Cookies in Orleans. Climbing aboard The Beast, we both mentioned being hungry. 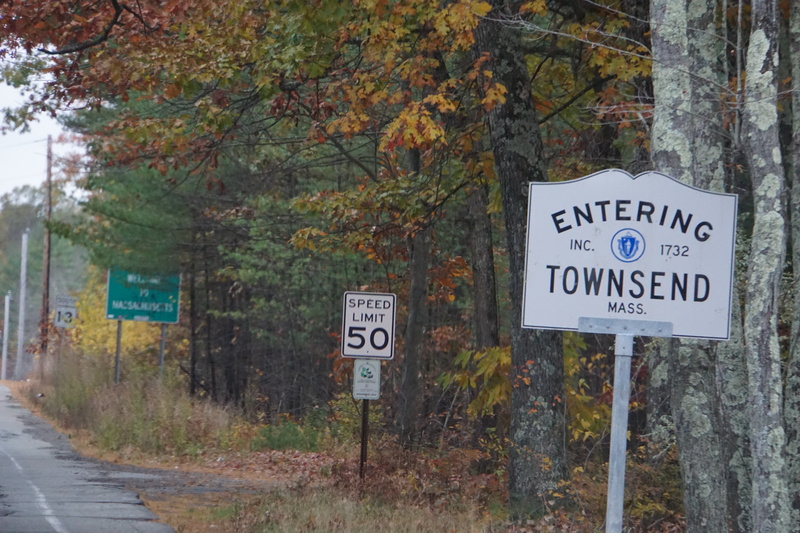 Should we push on to Provincetown or head back to Orleans? We chose to drive to the fist of the cape. It’s not that much further and we should find lunch there, perhaps some steamers. P-town was “happening” The street we drove in on led to a parking lot right on the bay. Before crossing toward the lot, I had to wait for a number of groups to walk past. They walked everywhere; on the sidewalk or in the middle of the street; quite a contrast to the near empty towns we passed. Great a parking lot. Better still, a sign out front read, “Enjoy Free Parking”. It was a large lot and it was nearly full. I recognized immediately that I would have trouble maneuvering the parking lot and would probably not find parking. Heading back out of town, we found a still larger and empty lot with plenty of parking and a short walk back to Commercial Street. We checked the menu posted outside the first restaurant we found. No steamers. 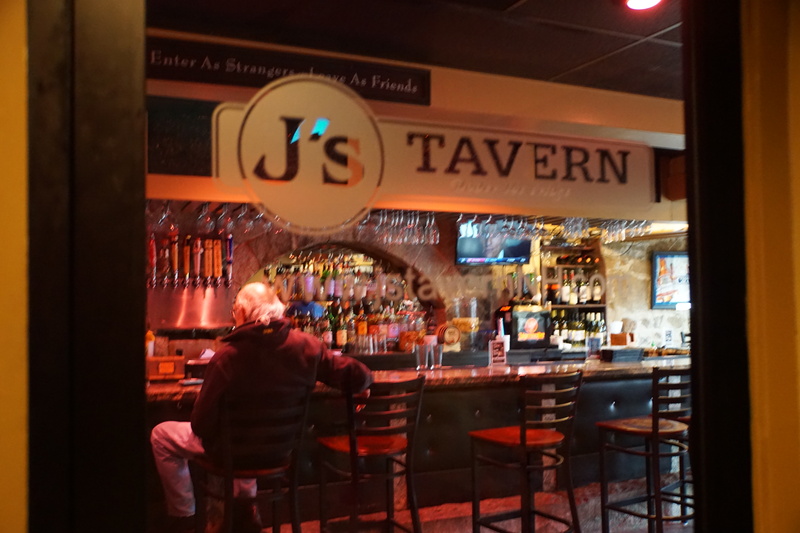 We went inside and found a typical warm dimly-lit bar and numerous tables and chairs, some with customers enjoying lunch. We waited a few moments hoping to ask if they had steamers. A few too many moments later, we left to walk main street. I’ve craved some steamed clams with beer since crossing the Mississippi. We walked on. Commercial street was busy. 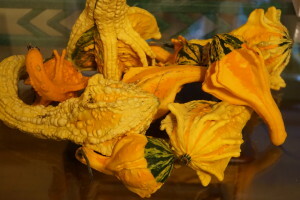 Two places appealed to us: The Squealing Pig and The Lobster Pot. The Squealing Pig was packed and we loved the aroma coming from the kitchen. The wait was too long; the Lobster Pot won out. 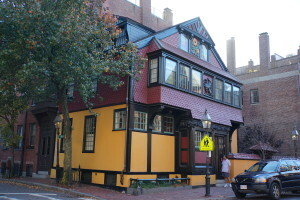 The Lobster Pot has a restaurant in the back on the ground floor and a bar and tables on the second floor. We were led to a side table on the ground floor when Ellen asked if there was seating for lunch upstairs. She preferred to sit facing the bay. “Yes, there is additional seating upstairs beyond the bar area. 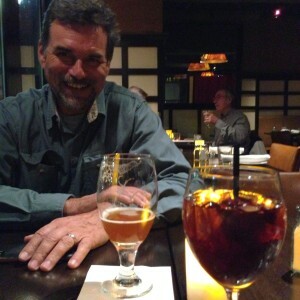 Yes, they have the same menu.” We headed to the bar and were seated at a table overlooking the bay. Just as Ellen wanted. 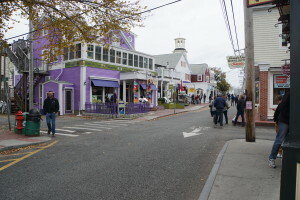 Ellen enjoyed a hot lobster roll and broccoli gratin, and I had clams; not steamed, but fried. They were great! Walking toward the Beast, I noticed a mid-sized animal loping behind our RV heading right-to-left. It was too big to be a cat. 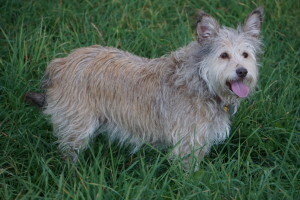 Dogs do not lope. I pointed it out to Ellen just as it disappeared behind the RV. Seconds later a white tailed fox appeared. 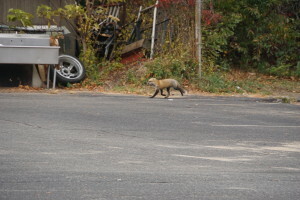 Its pace increased as two couples jumped out of their SUV to watch agape as the fox ran past. Ellen did get a photo or two before the fox disappeared. 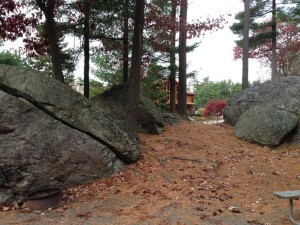 Bruce and Vivian had told us about Normandy Farms Family Camping Resort in West Foxboro MA. I had called earlier in the day and they were open and could accommodate us for two or three days. They would be full on the weekend; we would not have a space on Saturday but would Sunday afternoon. That’s fine. 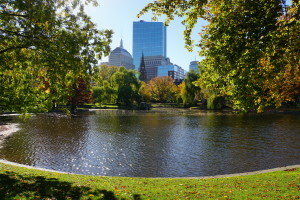 I asked about car rentals and Jessie said the enterprise was very close and would deliver a car, but that we should consider taking the train into downtown Boston and not driving. We left P-town headed to Foxboro knowing that we would miss the beginning of the game. Come to find out the game would not be carried on DirecTv. The Raiders are notorious for blacking out games. I was hoping that a local east coast channel would broadcast it. The JETS are local, right? Wrong. We arrived and were given site #1001, with a good view to the south through some trees and a cable hookup for local channels, but no channel carried the JETS game. We can watch The Good Wife and a few of our other favorite shows tonight and Wednesday if we chose to stay three days. Normandy Farms Campground is huge and very well appointed. The “office” is like a ski chalet. There is a heated indoor pool. 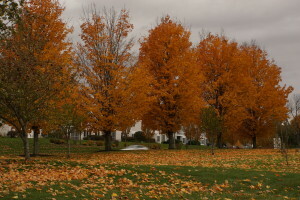 For the three weekends prior to Halloween, they have weekend events celebrating Halloween including hay rides. We have not walked the grounds, checked out the pool, the restrooms, or the laundry. We’ve settled in for the evening. Last night we learned that an “F” reading on our gray tank means. It does not mean nearly full or almost full or don’t worry about it full. It means full. I was settling in for the night while Ellen was organizing things on her way to bed when she noticed a rather nasty odor in the shower. She had washed out our crock pot earlier and that was enough to push the gray tank into overflow. A gray tank overflow is a pretty nasty thing. This was clearly my fault for not connecting the septic hose and draining the swamp. So it was that I found myself outside in the dark moving The Beast closer to the drain, monkeying with our sewer lines, and emptying tanks when I’d much rather be inside asleep. With the tanks empty, Ellen took on the task of cleaning out the shower pan. About an hour later all was well in Mudville, well almost. The next morning I tried dialing in DirecTv. To get closer to the drain last night, I had moved The Beast. That little move was enough to throw reception off. Even re-aligning the antenna failed. Next I wasted half an hour calling RV Service Centers in and around Foxboro looking for someone who could take us on short notice. All the large dealers were slammed. The soonest anyone could take us was Nov. 12th. We cannot wait around that long. Giving up I arranged for Enterprise to deliver a car to the campground. 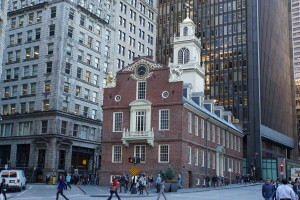 We plan to anchor The Beast for a few days and use a car to explore Boston, Cambridge, Arlington, and Martha’s Vineyard. Enterprise car rental often delivers to campgrounds if there is an office nearby. It’s a great business niche for them. I arranged for a KIA to be delivered at 10:30, giving me time for a shower (unlimited hot water, heated room, spotlessly clean) and to help Ellen with laundry. Enterprise Car Rentals, Foxboro Ma. At the office I bought another fifteen feet of sewer hose minutes before our KIA arrived. That rental went quite smoothly. For out of state rentals, Enterprise requires a major credit card and of course a valid license. We’re thinking that renting a car when we stop for more than two days makes more sense than purchasing, insuring, and hassling with towing car would. This was our first car rental “on the road” and it went very smoothly. I called Brad who said he was on his way and sure, he’d look at my problem. Ellen and I now were resigned to a day of rest with some work on Li’l Beast. I added a second latch to the most egregious door, the one that insists on slamming open around turns. Tested out our compressor and some new fittings, they work just fine. We unfurled our outdoor patio rug for the first time and folded it to make storage easier. I setup the fifteen foot sewer line extension. In the mean time Brad had arrived and was working on Joe’s rig. Sometime later I walked over to introduce myself to Brad and to be sure he didn’t forget me. Brad works out of a small van that is chock full of tools and parts. 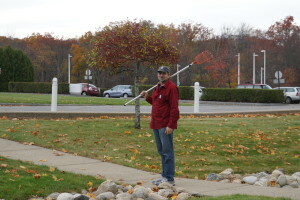 I was very impressed with Brad’s confidence, warmth, and the tools he brings with him on the job. Around 2 Pm, brad drove up behind The Beast and we got down to it. I said that first time we experience a problem with hot water was in the morning at a campsite what was closing. The campsite manager had said the water would be turned of at 10:30 Am. I left our line connected through the night. 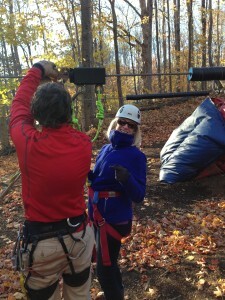 It dropped to 27 degrees, but with our black and gray tank heaters we were in good shape. However in the morning we had no water pressure at all, NONE! The campsite water valve was open, but there was no water in the line. The campsite manager had purged their pipes. I had used our water pump, but had no hot water pressure at all. Days later, the kitchen cold water stopped flowing. Brad said, “yeah, the campsite probably ran 120 psi. through their pipes. That’s not good for you RV. First he checked the aerator on the kitchen sink and found some debris in the screen, but not enough to stop the flow. Next Brad asked if we had a diverter for the under-sink filter. We scrambled to locate the plug, which we had moved into successively remote locations. With the filter removed and the plug in place, we had cold water flowing. The filter was clogged. Problem #2 solved in about fifteen minutes. I run with two filters one outside and the one that went bad. I wonder how effective the outside filter actually is. Next Brad tested our lines. He switched the hot tank diverter to see how the system behaved. He asked how many check valves The Beast has. Then he went to the lowest point of the hot water lines, the outside shower and turned on the hot water. There was no flow. Ah Ha! Brad said there is no flow out of your hot water heater. It’s your check valve that prevents cold water back flow into the hot water tank! I had read about this, bought a replacement check valve at Camping World, but I did not have the tools to easily replace the valve. I gave Brad the check valve and he installed it in no time flat. That fixed our second hot water problem. Brad was very easy to talk with. In fact we spent more time talking with Brad than it took him to fix our problems. Brad said that had I called him to schedule this repair, he would not have been able to do it. He has over a thousand clients and he is book through December 2nd. 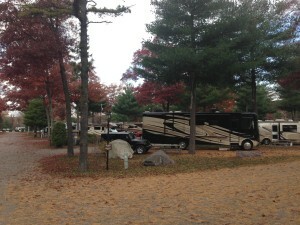 Since he was here at the campsite to winterize Joe’s 5th wheel he’d take the time to look at our problems. Wow. If I had not mentioned our trouble to Joe this would never have happened. The only other fellow I’ve met who instills the same level of confidence was Tim, the fellow who did our initial checkout at Crowley RV. I tried to have Tim look at The Beast, but he was booked out a month. Brad did say, “Call me anytime” As he is a mobile service I asked, “Is a service call to California out of the question?” Brad’s initial charge is $60 for travel and $70 for the first hour. He charged us $70, waiving the travel charge. He may not be able to help you out, but it is worth a call if you’re stuck near Foxboro Massachusetts. 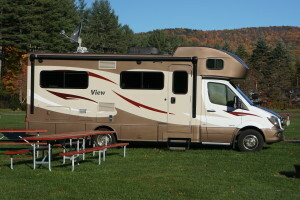 Brad’s RV Repair 508-951-7607 he is a Full Service Master Technician and a very nice guy. When we finished cleaning up it was past 3 Pm. We’re running out of Nespresso capsules and there is a Nespresso Boutique at Bloomingdale’s in Newton, a thirty minute drive. Off we went. Our iphone GPS guided us flawlessly to Bloomingdale’s, once we knew for sure that’s where we wanted to go. 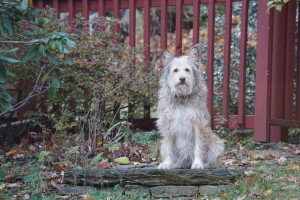 Ellen called Nespresso to find that there is a boutique in Chestnut Hill. ???? 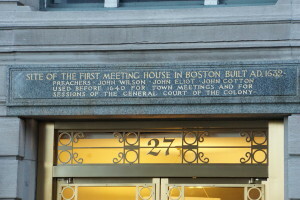 My research showed 225 Boylston St Newton as the address. 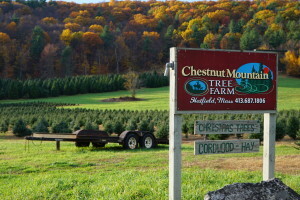 We went round and round for a while before realizing that Chestnut Hill is a shopping center in Newton. 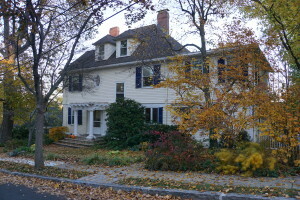 It’s address is on Boylston St, Newton. The Nespresso shop is on the first floor of Bloomingdale’s men’s store. We found it with ease and after a short wait for two customers ahead of us, we returned a large number of capsules for recycling and took about 150 away with us. 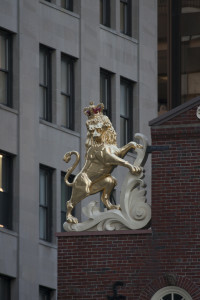 There are only two Nespresso outlets in Massachusetts, both near Boston. We collected 2 bags for recycling, via US mail, free of charge. We were both hungry and asked our sales fellow where he would recommend we eat. He mentioned The Cheese Factory, a Mexican place, and two Japanese restaurants. 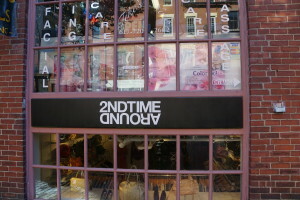 He said by far the better one is on the 2nd floor. That turned out to be Tokyo Japanese Steak Restaurant. We love steak, but why eat beef at a Japanese Restaurant. Sure, Kobe Beef is world famous, but for Japanese, we think sashimi and sushi. We set our hesitation aside (fish at a beef restaurant is usually a bad idea), and ordered our favorites: Hamachi Sashimi, Spicy Tuna Hand Rolls, Spicy Hotate Roll, and a Dragon Roll. All were very satisfying and delicious. Our iPhone GPS guided us back to the campground. We fearlessly negotiating traffic circles as they are called in Massachusetts, watched for two police vehicles that Waze pointed out, and avoided much of the 6 pm traffic. Waze is pretty amazing. Waze records information from its subscribers to compare subscriber speed with posted speed limits to gauge traffic patterns. It is very good at guiding a driver around traffic and it did not let us down. “Home” now, we are fully connected: our stabilizers are setup, our antenna is deployed with exceptional reception, and we have fully functional hot and cold water. We’ll check out the indoor heated swimming pool, weight room, and pool tables some other day. 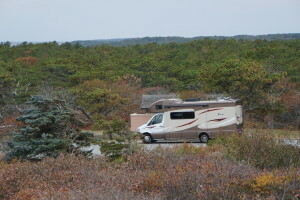 This entry was posted in Massachusetts, RV Trips, The Beast, To New England, Travel Resources and tagged Brad's RV Repair, Cape Cod, Marconi Station, Massachusetts Fall Foliage, Nespresso, no hot water pressure, Normandy Farms Family Campground Resort, Provincetown, RV Repair, RV Service, Scusset Beach Campground, Tokyo Japanese Steak Restaurant, White Cedar Swamp on November 3, 2015 by up4air. I had mixed feelings leaving Ed and Jean this morning. 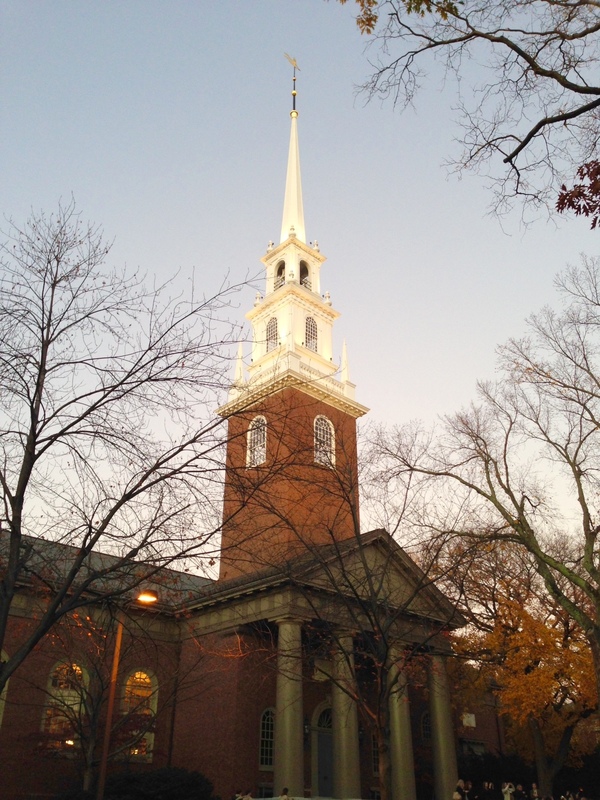 I look forward to new adventures: Cape Cod, Boston, Martha’s Vineyard, and wandering our way. Each will be exciting! But leaving Ed and Jean is sad. I would love to spend more time with Ed and getting to know Jean better. Still it was time to go, The two extra days we willingly lingered meant cutting out our trip to North Hampton and Rye Beach New Hampshire. 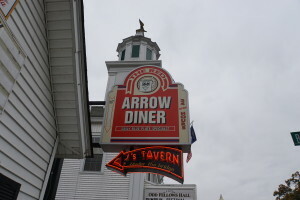 There will be no stop at Brown’s Restaurant Hampton Beach NH. The mountain coaster and zip lining we did in the Berkshires, meeting Terry, and having another two days with Ed and Jean more than make up for the two “lost” days. Ed and I played guitar some and Ed showed me some of his prints. He carves linoleum and creates prints from them. He has a press in his “man cave”. He teaches computer programming to elementary school children a few times a week. He also reads about computer programming and algorithms. 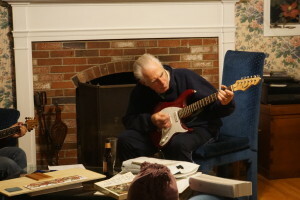 For a retired guy, Ed keeps himself very busy. Then he and Jean are building a custom home in the hills that is amazing. The electric guitar Ed is shown playing, he found in the attic of their home! It’s a good guitar with great action. 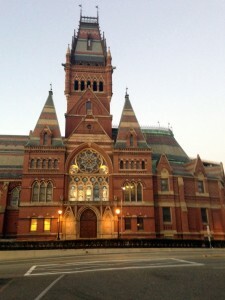 After saying our goodbyes, we headed east toward Boston leaving late, much later than usual. We had a surprising pile of stuff to pack back into “The Beast”. 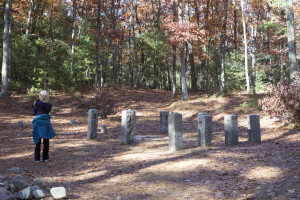 Looking for campgrounds around Boston, AllStays showed three all-year campgrounds: one in Worcester, one in Rhode Island (!?! 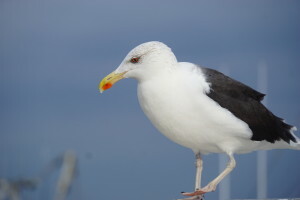 ), and one on the Cape. 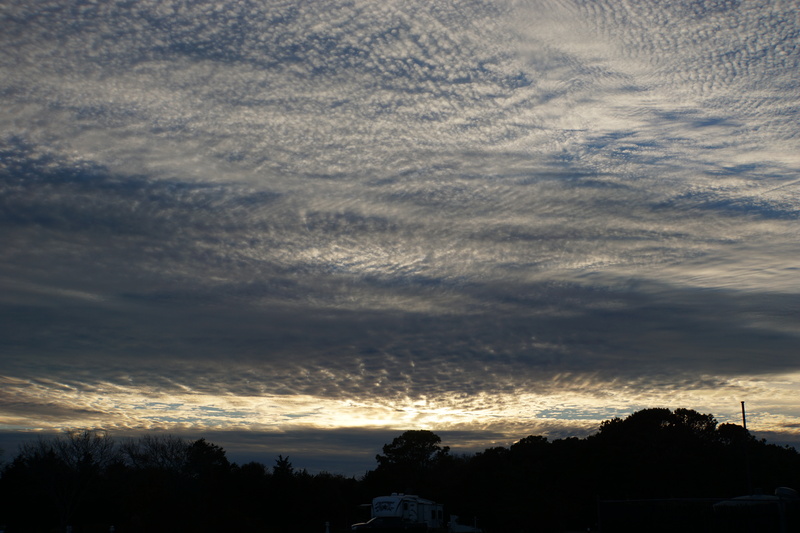 We chose to try Scusset Beach State Park on the bay side of Cape Cod. About an hour into our drive, Ellen called the state park and got no answer. This is usually not a good thing, It indicates a closed campground. Still we drove on with a sense of foreboding. Typical for us, as we neared the beach we made a wrong turn that sent us over the Sagamore Bridge. In a futile attempt to U-turn, I turned into the parking lot of a huge supermarket. We needed some provisions and took the opportunity to stock up. Back on the highway and knowing exactly how to get back over the bridge, I was forced the wrong way on SR 6 and went another five or six miles out of our way. That’s no big deal, really. Back over the bridge, we turned onto Scusset Beach Road headed toward the park. Our GPS went wacky and kept telling us to turn around and take some other road. 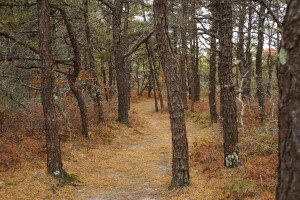 Knowing better we followed Scusset Beach road to the park. As we arrived, our McNally GPS chimed in with, “You have arrived at your destination”. Good to know, I thought. We drove into the reservation parking lot, which was practically empty. I walked around the reservation building and found it deserted. There was a map of the park with a number of designated RV campsites shown. 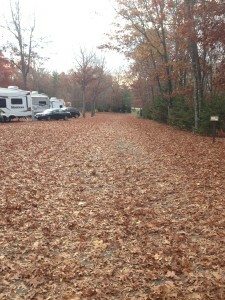 We drove on to the RV campground. 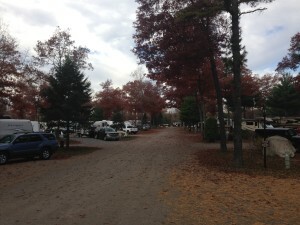 The RV campground is a combination of open campsites and some campsites sheltered by trees. 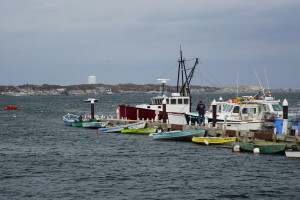 The campground is located alongside the Cape Canal which allows boats to go from the bay side to the ocean without navigating around the cape’s arm. It is a wonderful place to camp off season. We saw a few large RVs and some 5th wheels as we drove in. Great, it’s open we thought. 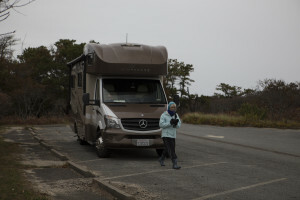 As we neared a 5th wheel, I stopped, got out, and talked with Bruce and Vivian about the campsite. As luck would have it, the campground is partially open. 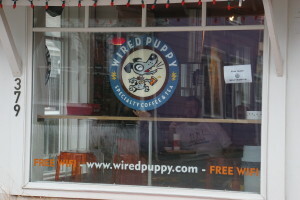 It is open on Thursday, Friday, and Saturday of the week and closed the other days. 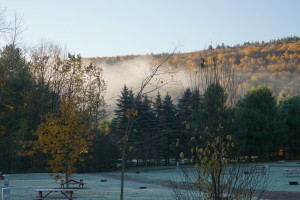 At the end of December the campground may close until spring. Bruce said the ranger he spoke with “was not sure” when they would close, but for now the water was still on. We had a place to stay for the night! My plan to rent a car and make forays to Concord, Lexington, Arlington, Cambridge, and Boston from a campsite were dashed. We had no place to camp tomorrow. Now what would we do? Bruce and Vivian to the rescue! 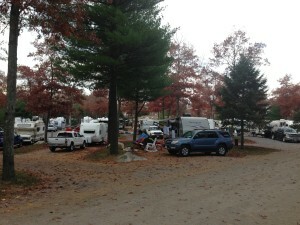 They recommended a year-round campsite in Foxboro that is five star and full service. They could be booked full weekends, but Bruce thought on Sunday and mid-week we would have no problem getting a site. 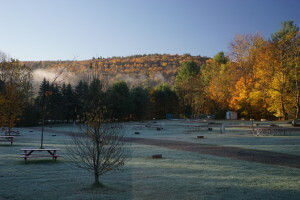 With the sieve my memory has become of late, Vivian wrote down the camp’s name: Normandy Farms Campground Foxboro Ma. 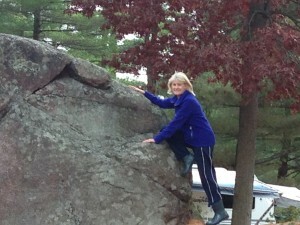 As I was talking with Bruce, Ellen climbed out of “The Beast” and joined the conversation. RV people are a great. We spoke until it was apparent we all were getting cold. 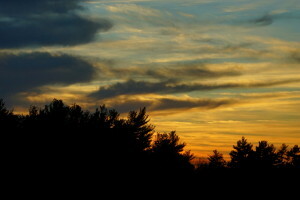 It was a brisk 46 degrees with the sun setting. We chose a site and settled in with good sat and excellent local channel reception. We walked the beach. The east coast beaches are of soft white sand and Scusset Beach is no exception. The cape channel was “right ov’a they’ya”. There were two late-evening fishermen who were not giving up and a handful of people walking back from the beach as we walked out for the sunset. Headed back to Li’l Beast, we checked the rest rooms to find them open, heated, and very clean. There was a note on the men’s room stating that the restrooms will be closed for the season at 10:30 AM November 1 (tomorrow!). Again we squeaked by with a night camping as the campground closed. This was the sixth time we’ve done this on our trip! Back at “home” I called Normandy Farms Campground. They are open. We can chose our site when we arrive. Yes there is a car rental close by, but we might consider driving to a nearby subway station and taking a train into Boston. There’s no problem with sites this week, we can stay as long as we like. They even have a concierge who can help us with our plans! If we had not stopped to talk with Bruce and Vivian, we might never have known about this place. This is our first full-on “FAIL” for AllStays. We’ll have to revamp our campground search to include listings from a 2015 book. I checked the Patriots schedule hoping that they would not have a game scheduled tomorrow. They do not. The Pats took the Dolphins apart last Thursday and do not play the weekend. Good Stuff all around. 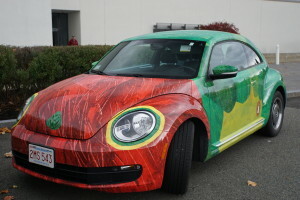 We’re snug as a bug in The Beast on Halloween evening watching Stephen King’s Red Rose on DirecTV. 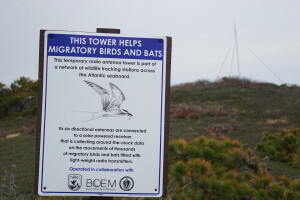 Tomorrow we will head further east, up Cape Cod to White Cedar Swamp near Marconi Station. Terry said the forest was like the “forest of despair” in the Princess Bride. I knew immediately what she meant. Also Marconi Station was one of two stations setup to test Marconi’s first cross-Atlantic radio transmission. 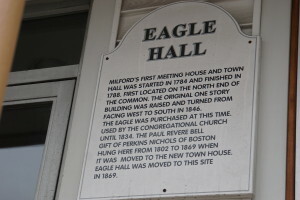 The other station was established in Maine. 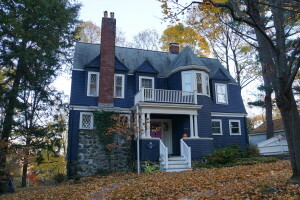 It’s about an hour’s drive out the cape to Marconi Station and another two hours back from there to Foxboro. The JETS play the Raiders tomorrow at 1 PM West coast time. We’ll be settled in at Normandy Farms by game time at 4 PM EST. We just have to remember to set our clocks back an hour tonight. I wish that Ed, Frank, Jim, and I could re-unite. Perhaps one day Frank, Ed, and I will. I miss Jim and think of him from time to time. 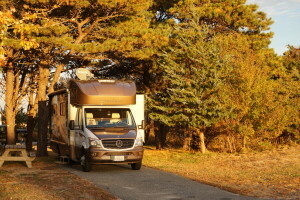 This entry was posted in Massachusetts, RV Trips, The Human Experience, To New England, Travel Resources and tagged Cape Code, Late season camping Massachusetts, Normandy Farms Campground Foxboro Massachusetts, Scusset Beach State Park Massachusetts on October 31, 2015 by up4air. 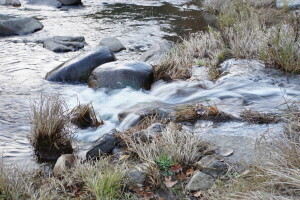 It seems that every time we stop to visit with friends, we let our blog go for a while. This past week has been no exception. 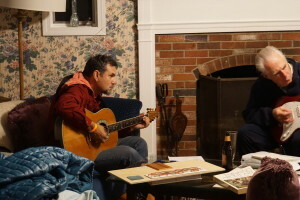 We’ve been having such an enjoyable time visiting my old friend Ed O’Neil and getting to know his wife, Jean,, that we have not made time to keep our blog current. 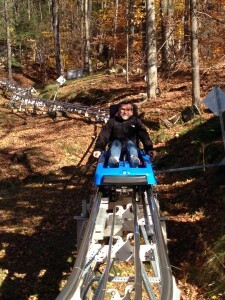 This afternoon we will be “doing” a mountain coaster and a zip line in the Berkshires. We’re taking time ahead of this excitement to catch up. It poured last night. Our site at Country Aire Campground is in a depression. We actually woke up to check for flooding! That’s what watching the Weather Channel will do for you. There’s lots of flooding in Texas and it’s headed to the south. But here in Massachusetts there is none. It was 44 degrees in the morning, comfortable for this time of year. 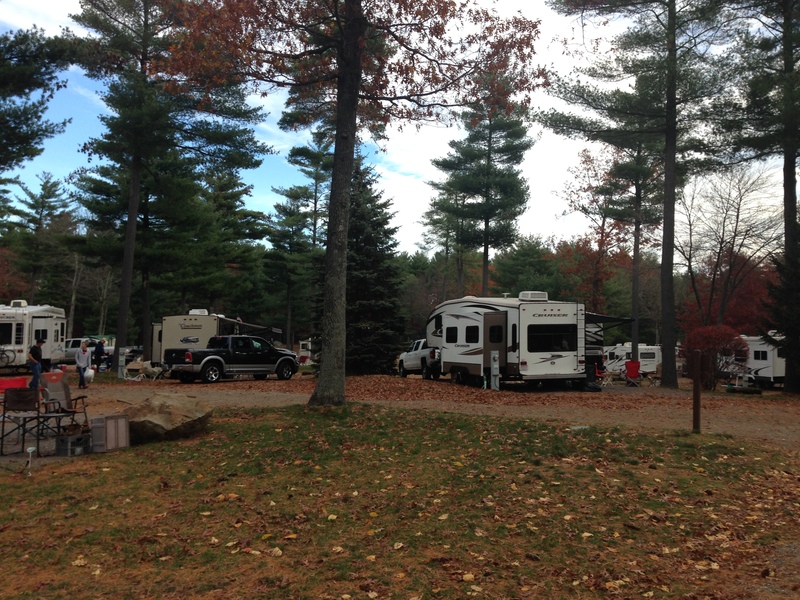 Our campsite sits in a large meadow with thirty one other RV sites and a scattering of tent sites. One other RV was parked well away from us. There were two tent campers off in the trees by a creek. Facing the south, we had early morning sun that warmed things up quite nicely. 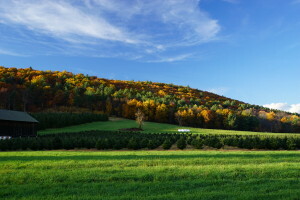 There’s a view of a hill and ridge to our south dotted with orange foliage between the pine trees. This is a peaceful location. We got moving slowly with a variety of options for things to do today. #1 on the list, stopping at 1:00 pm for the JETS PATS football match. 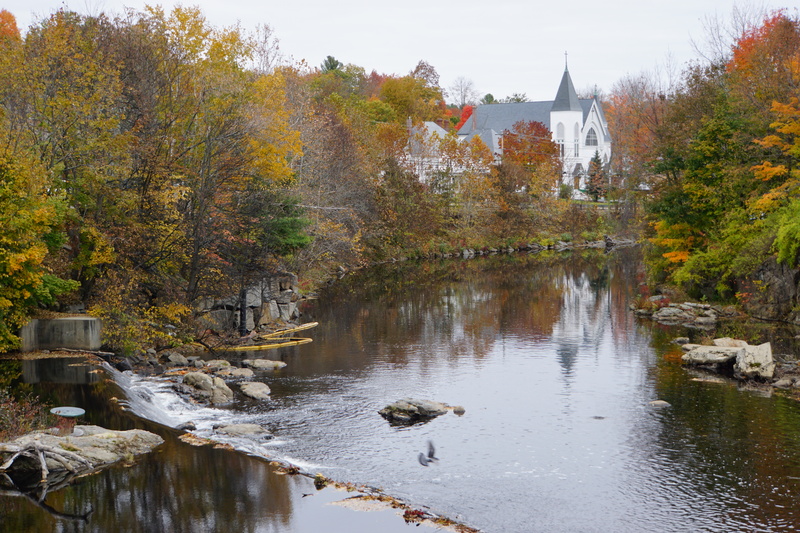 We chose to explore the town of Charlemont to our west. There’s a very helpful tourist map, Greater Shelburne Falls and Mohawk Trail Region, that I highly recommend. We found ours at the campsite. It’s a reduced map of the area with points of interest well marked on the map. We drove “down the hill” or what I thought was a hill. It’s pretty flat getting from the camp to SR 2. We drove into town looking for a market to buy bread to make sandwiches for lunch. Four of Five shops along SR 2 were closed. We found a hardware store; the Coffee Bean; Berkshire Pizzeria; and Cold River Package, Market, and Cafe open. Not needing hardware, coffee, or pizza, we stopped at Cold River. In Massachusetts people buy their booze in liquor stores. These stores have a huge inventory of alcohol. Supermarkets in California have a standardized selection with very little unusual or locally produced products. Not so stores in Massachusetts. It was fun just looking around. We replenished our chocolate and vodka supply. Unfortunately we did not find a liquor to replace our near gone sour cherry. This was a package store in a remote small community and the selection was mind boggling. We’ll find our sour cherry in the next large town for sure. 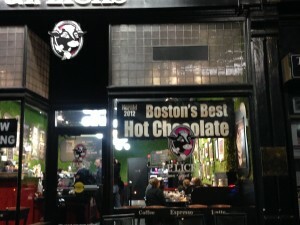 The vodka & chocolate were taken to the Beast while Ellen checked out the restaurant. Typical of The Beast, a couple drove up and said, “That is the perfect size for us! We’re thinking about taking a trip to Arizona next year and this would be perfect for us.” We were off talking about RVs, travel, and Charlemont. Ellen joined us moments later. 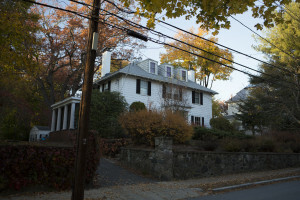 The couple lives in a classic New England home sitting right beside a pool “just up the road”. The house has been in the wife’s family for generations. She inherited the home a year or two ago. 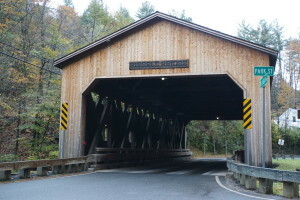 They described how to get there and that we would go through a renovated covered bridge on the way. Ellen asked if it was OK we took photos of their house. “Of course, people stop for photos there all the time. I even have cards printed up about the house. we call it “Poolside” They were headed to the restaurant for lunch. It was clear they wanted us to join them, but we have a football game to watch. We drove off in search of Poolside, which was quite easy to find. There was a place; to turn around and park on the fork to the right. 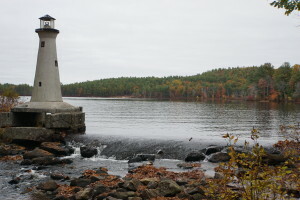 The house sites in the center of a fork in the road right on a pond with a low head dam and waterfall. It is quite a setting. 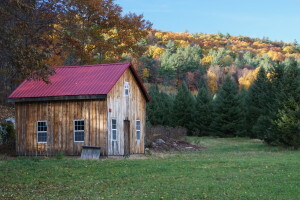 “I could live here!” Ellen responded with, “It would make a nice spring or fall home, but not in the winter”. That, my friends, is progress! We took a number of photos of the pond,, their house, and the covered bridge. There was an abandoned school bus by the side of the road that we wanted to document, but missed it on the way down the hill. How do you miss a school bus? Back at Country Aire, we plugged in and enjoyed a close football game that the Pats won. Much to Ellen’s chagrin. 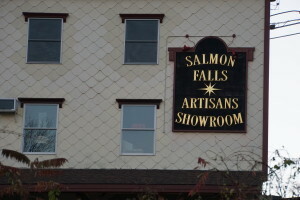 In the afternoon we explored Shelburne Falls. Turning off rt 2, there is a caution sign with 10′ 6″ in bold lettering and nothing else. The Beast stands 11′ 3″. 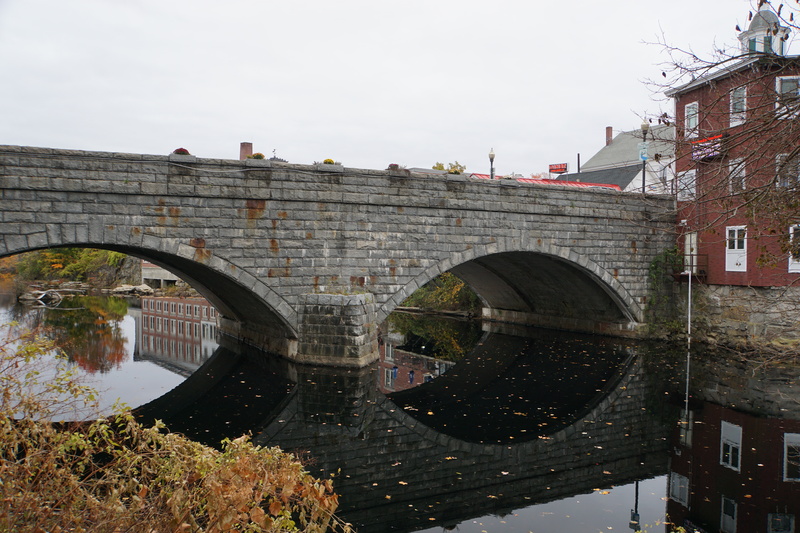 We headed toward the town of Shelburne Falls, knowing that a U-Turn could be coming up. 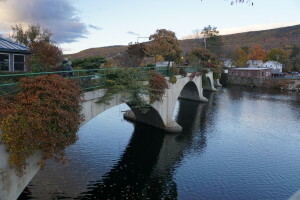 Shelburne Falls sits on side of the Deerfield River and Buckland sits on the other, though I think both are referred to as Shelburne Falls. 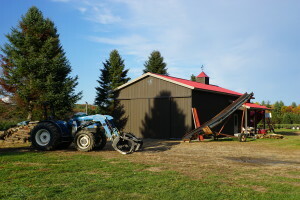 That 10′ 6″ briidge is the one that connects the two. I took a left just before I would have been committed to going over the bridge, and found parking around back behind Main Street. A ceramic shop was the first business we found that was open. They were closing, but the shop gal let us browse. We asked what she would recommend for dinner. There were two places she mentioned, one had moved and the other was just across he bridge, West End Pub. 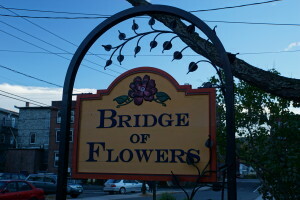 We had seen a sign for “the Bridge of Flowers” as we parked. Ellen asked what is the flower bridge. 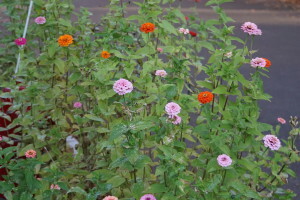 She said, “You haven’t seen the Bridge of Flowers? You have to go.” We left the shop and walked the street. Most of the other shops were closed on this side of the Deerfield River. 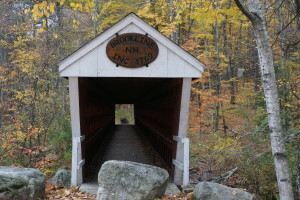 We walked to the Bridge and crossed the river to the Buckland side. Here too, most of the shops were closed. We walked to the dam. 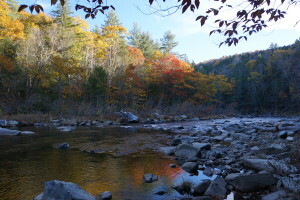 The dam is one of a number of active hydroelectric plants on the Deerfield River that are now controlled by an authority in Vermont. 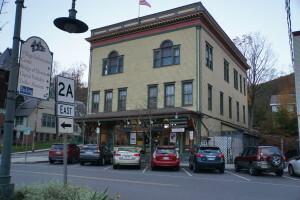 The West End Pub sits at the end of the Bridge of Flowers with an enclosed patio overlooking the river and the bridge. We had the best meal of our trip thus far at the West End Pub. The menu listed fried scallops. Ellen asked if they could be grilled and yes, Ellen had grilled scallops. I had the burger au Poivre done medium rare, both were superb. Later in the evening we walked back over the Bridge of Flowers and drove “home” to Country Aire Campground. 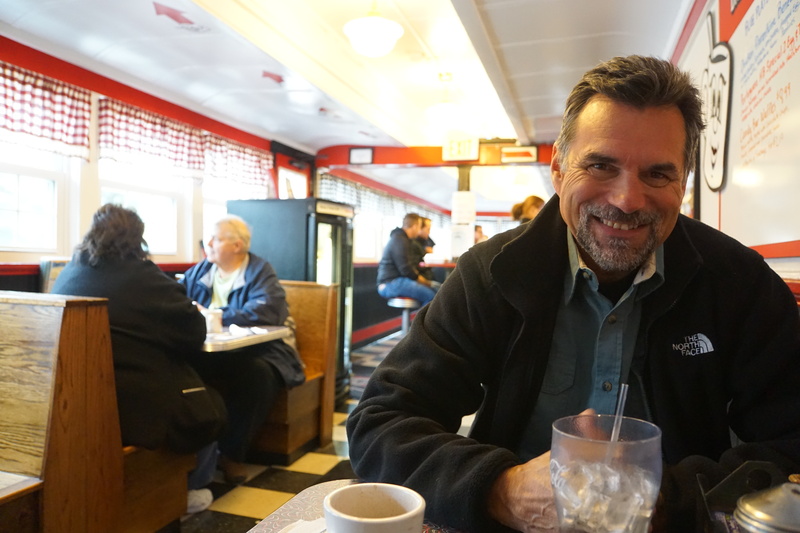 The next day, Monday 10/26, we drove on to meet Ed O’Neil and his wife of 37 years, Jean. We planned to meet them for lunch at the Smithsonian Chowder House in Hatfield at noon, but we underestimated the drive time to Hatfield from Charlemonte. We called ahead to say we would be late by thirty minutes. 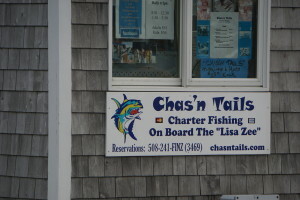 Ed said they were at the chowder house already. We passed an exit for Hatfield as we headed south. Ed told us to take exit 21, which we did. We backtracked to the chowder house. It was empty. We thought maybe there was another Smithsonian Chowder House. The chowder monger said there was another one further north. We walked outside noticing that there was a furniture shop across the street just as Ed had mentioned. We decided to wait, thinking this must be the right place. People came, parked, and went for the next ten of fifteen minutes: no Ed. At this point I was wondering if I would recognize Ed after 46 years. Sometime later a car pulled up and there was Ed. It was unmistakably Ed, After all these years it’s as if I had never left. It’s great re-kindling our friendship and getting to know Jean. Within minutes the four of us were all chatting about life. 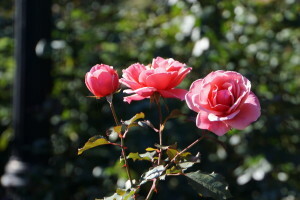 We planned to visit with Ed and Jean for three days. 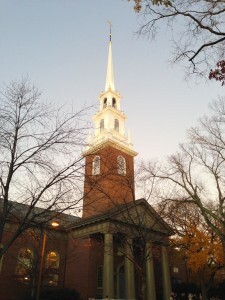 We have many places to explore in Massachusetts, Rhode Island, and Connecticut; time is valuable and may become critical as we drive home. Today is Friday, 10/30/2015. We thought we would head east to Boston on Wednesday. Tuesday evening Ellen asked Ed if there was anything he wanted, thinking she could get him a drink or some water. He said, “Yes, another 24 hours.” We stayed through Wednesday AND Thursday when Jean suggested we take a zip line on Friday afternoon. 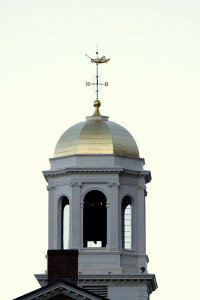 The weather on Thursday hit the low 70’s in Hatfield. Today should be similar if a bit cooler. 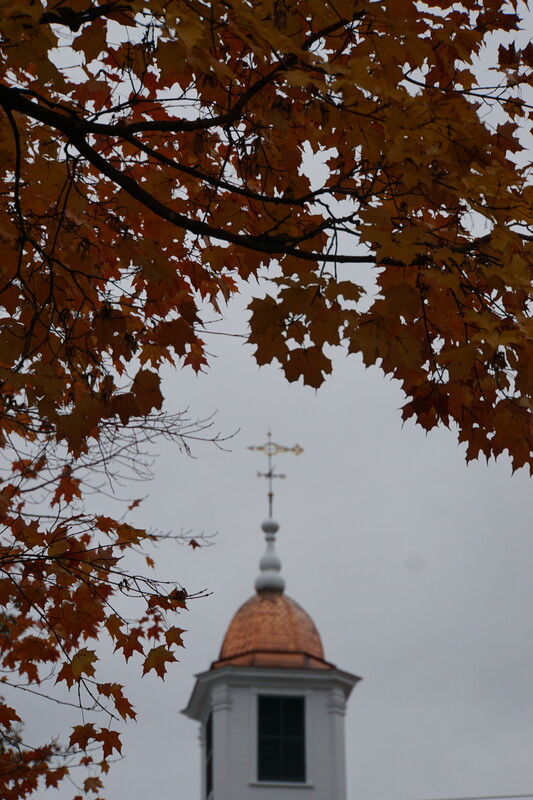 Temperatures will be cooler In the Berkshires. We’ll just bundle up. It feels to me like I’ve been living just around the corner from Ed these past 46 years. We picked up where we had left off, going over events in our lives as teenagers; some that we shared or knew about already and others that were a surprise. It can be such a joy re-discovering old friends. Ed and Jean have done quite well for themselves. They are building a custom home in the state. The home is almost finished on the outside while the interior is framed out with the electrical and plumbing in place. The finish work has not begun. It will be a marvelous home. It is very thoughtfully designed with state of the art energy saving features. 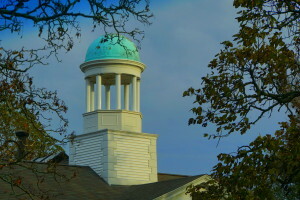 The steel roof is a discontinued color that looks great. 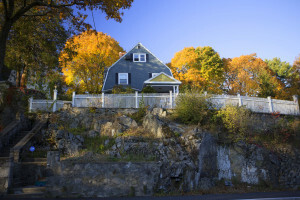 Jean likes the color and does not look forward to covering the southern slope with 27 solar panels. We will be on our way tomorrow, though we would enjoy staying another week. This is so true of all the friends and family we’ve met on our trip. 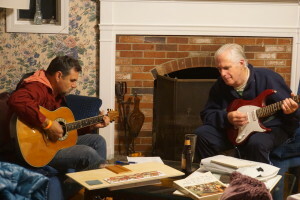 For me though, playing guitar, talking with Ed, or just sitting around brings back life in Arlington with Ed, Jim, and Frank before we went off to college in “the good old days”. Driving off to our next adventure will leave me with a poignant sense of loss. We will make it a point to return to Ed and Jean in the summer or next fall on our way out to or back from Europe. 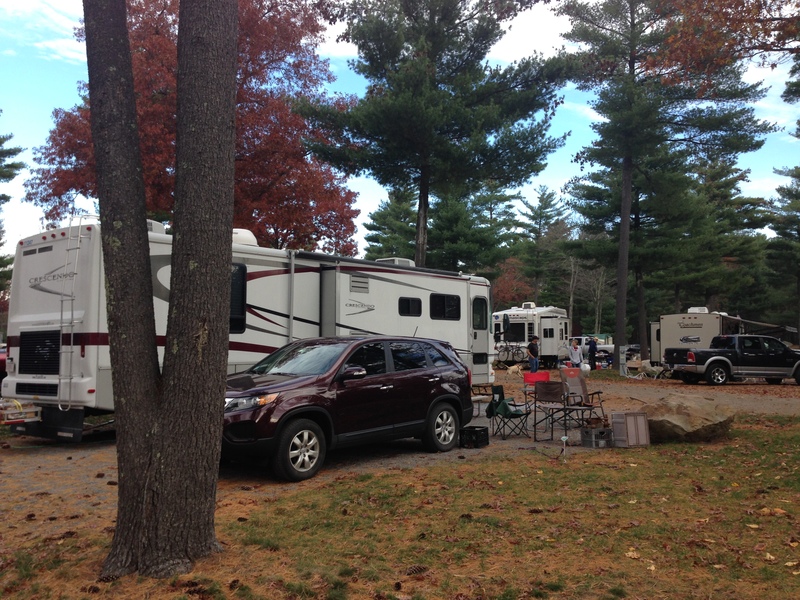 This entry was posted in Massachusetts, RV Trips, The Human Experience, To New England on October 30, 2015 by up4air. We stayed at Friendly Beaver Campground near New Boston. The temperature dropped quickly after dark. I pulled the water hose inside and ran the tank heaters overnight. The temperature had dropped to 27 degrees around 8 am. The sky was overcast and threatening rain. 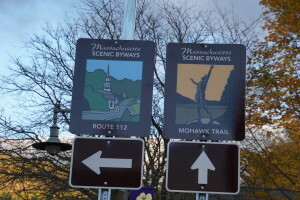 There are any number of routes we could take to get from New Boston to Charlemont Massachusetts on the Mohawk Trail. 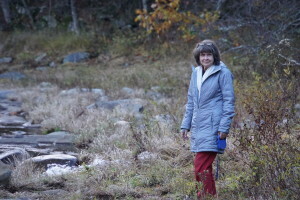 Ellen and our GPS agreed that we should go south through Milford NH. 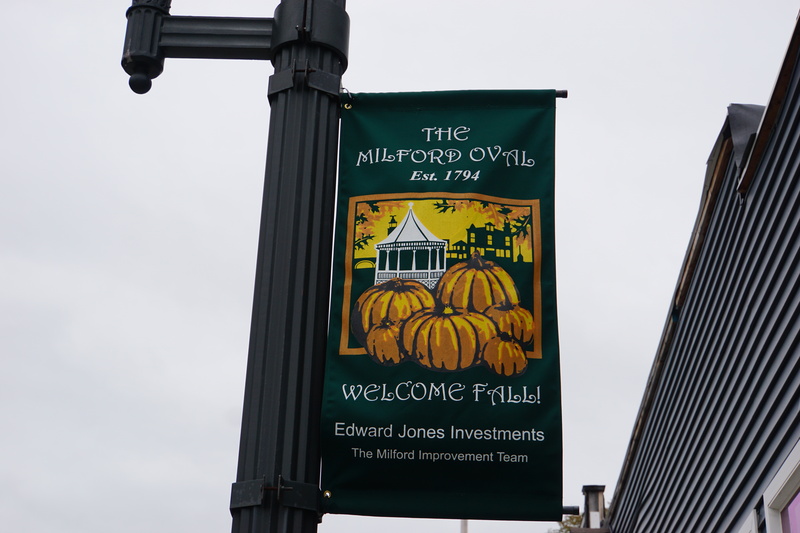 Milford is a much larger town than we had expected after seeing New Boston and other “towns”. 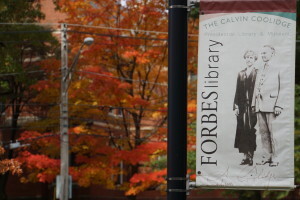 Yes, it was cold and cloudy, but we had to walk the town and perhaps have lunch at a cafe. Most small towns in New England were founded on rivers or lakes. 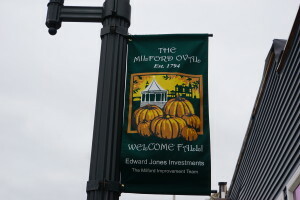 Milford is no different. It sides astride the Souhegan River. 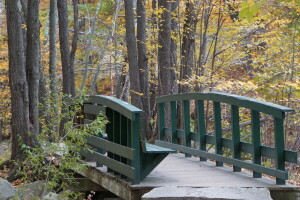 If you walk across the bridge heading out of town, there is a wonderful park to your left. We walked the park, then went back into town. 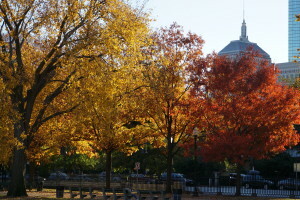 Local news reported that the foliage in the Merrimack Valley was at peak now. 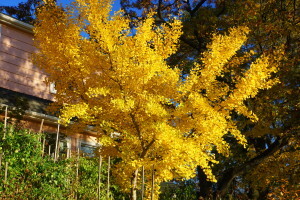 The foliage turned a week or two later than typical this year. 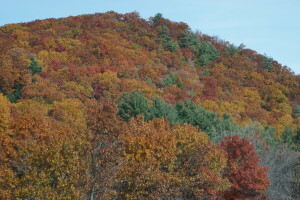 The trees turn color when the temperature drops near or below freezing. 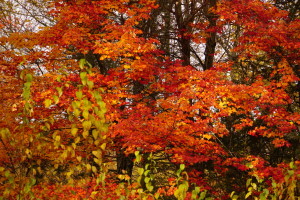 Record high summer like temperatures three weeks ago delayed fall. We are now in the grip of a cold front pushing in from Canada. We held off choosing where to have lunch until we had walked the town oval. 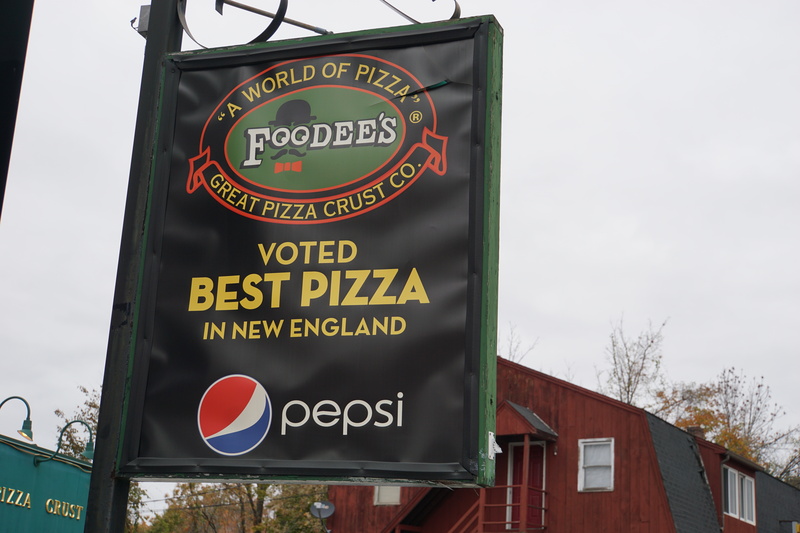 We happened by “the best pizza in New England” and had to stop in. It was empty but for a couple waiting for their order. Anthony walked out from the back and asked, “Can I help you?”. 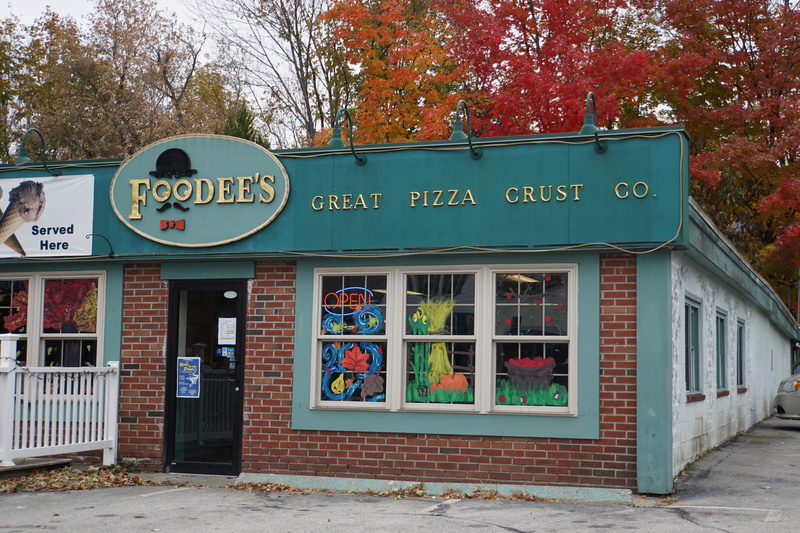 we talked about their pizza, the shop, and the town a bit. Ellen noticed an “Eat in or take and bake” sign and asked about taking a pizza to go. We settled on a fresh tomato pizza with added red peppers and pepperoni. Anthony said he would hold off making the pizza for 45 minutes and that we could pick the pizza up later. No need to pay for it now! I won’t be here then, my sister will make your pizza. Great! Off we went in search for lunch. The pizza would go in our ‘fridge for dinner later. 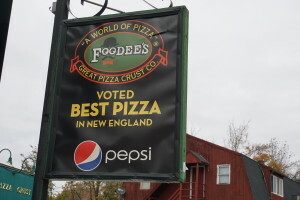 The Best Pizza in New England!?! 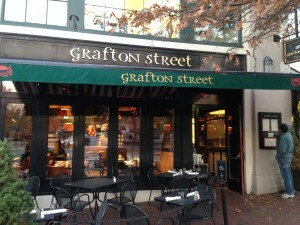 We looked for a prominently advertised Union Street Grill, but couldn’t find it. Ellen stopped two women and asked about the restaurant. One pointed out the location, almost out of town, the last building on the left. Then she said, ” we’re going to the diner for lunch and they have good.” We parted ways and found the Union Street Grill and noticed only one couple at a table. We decided to skip this one and headed off to the diner. 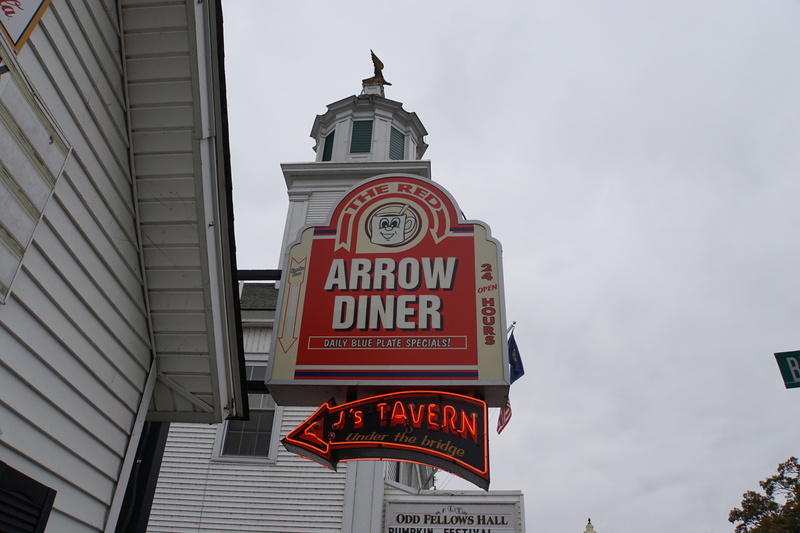 We ate at the diner, though the tavern below the diner and under the bridge would have been a better choice. They’re co-owned and share the same menu. 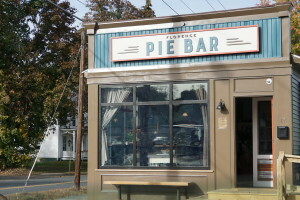 The diner is a typical 40’s place where the tavern has a warmer vibe. 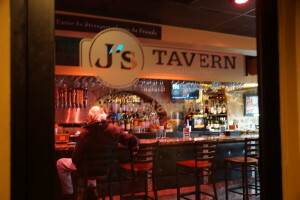 Oh, and the tavern has a full bar. 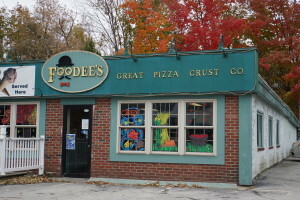 Back at Foodies, Abigail made the pizza for us while we talked with the owner. He had owned two pizza places, but bad management at his other store forced him to close it. He has the one shop. The pizza arrived, looking great heaped high with cheese. Then Abigail realized she had forgotten the pepperoni! She took the pizza back and returned with the pizza piled higher with cheese! It was huge. Our conversation with the owner wound down and I made to pay for the pizza. He said, “I thought you had paid already!”. “No.” He then gave us two free sodas: one Lime Rickey and one Root Beer. 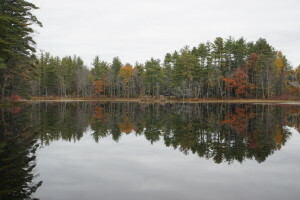 Heading out of town, we passed a still pond and we took these photos. There’s a small commemorative park alongside the pond. 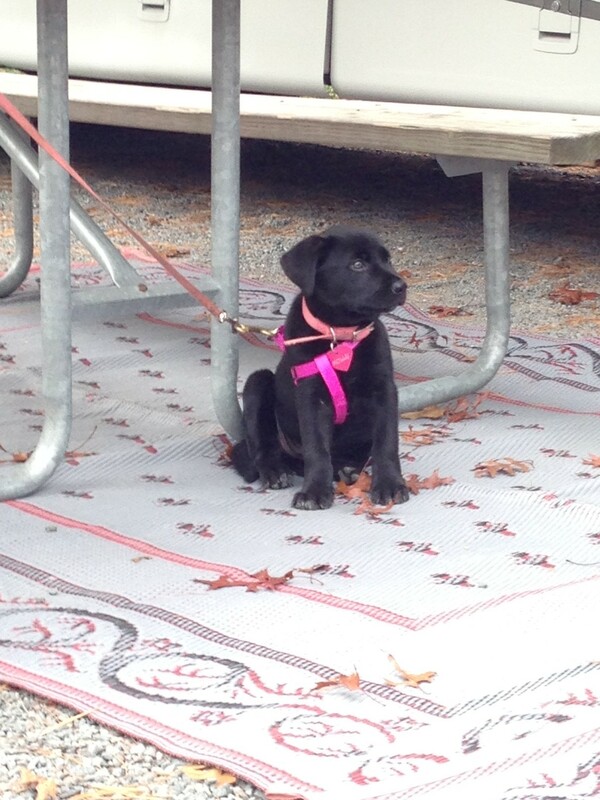 It was a chilly day for a race…. Some time later we drove into Massachusetts. 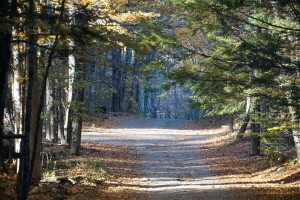 SR 31 through New Hampshire is a wonderful road. It’s smooth with minimal bumps or repaired potholes. Not so for the first dozen miles or so in Massachusetts. The road was horrible with an extremely high crown and bumps, shimmies, and shakes. On par with roads in Indiana. Some miles later the road smoothed out, but the high crown remained for much longer. 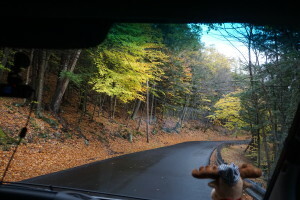 We skirted Fitchburg taking SR 2 west toward Miller’s Falls, Shelbourne Falls, and the Mohawk Trail. As usual, most of the campgrounds along our route were closed. 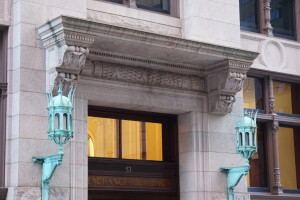 Even those listed as closing in late October had closed. There was one campground that listed November 1 as their last day open. Ellen called and yes they are open and yes they have sites for a 24 foot RV. We continued on SR 2 to Charlemont Mass. 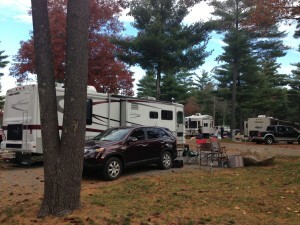 and the Country Aire Campground. Art and Lisa greeted us and checked us into a site with clear view to the south, cable, water, and electricity for $25. We opted to stay two nights. 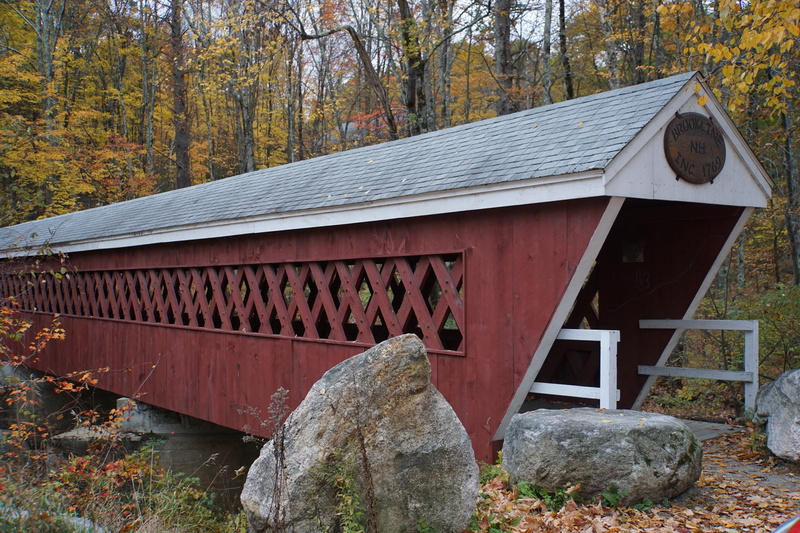 There are a number of small towns along the Deerfield River to explore. We’re not due to meet Ed O’Neil until Monday and we’re less than an hour away. Setup went quickly. We pre-heated the convection oven to 375, placed the pizza directly on the glass carousel, and popped it into the oven. Instructions suggest cooking for 12-15 minutes until the cheese freckles. It took longer than 15 minutes, but finally sometime after the cheese melted it began to freckle. It was tricky getting the pizza in the oven and again getting it out, but all went perfectly. The pizza was perfectly done. The crust was crisp and crunchy, the toppings cooked through and very hot. It was a great pizza. We’ll cook many more in the convection oven. That night it rained cats and dogs. The temperature hovered around 44 degrees. We were snug in The Beast. We ushered out another Wonderful Day, looking forward to our next day’s adventure. 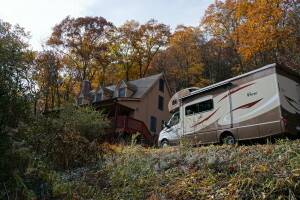 This entry was posted in Massachusetts, New Hampshire, RV Trips, To New England and tagged 2015, Charlemont, Country Aire Campground, Fall Foliage, Friendly Beaver Campground, Massachusetts, Milford, Mohawk Trail, New Boston, New Hamshire, RV, RV Massachusetts, RV New England, RV new hampshire, Townsend on October 25, 2015 by up4air.